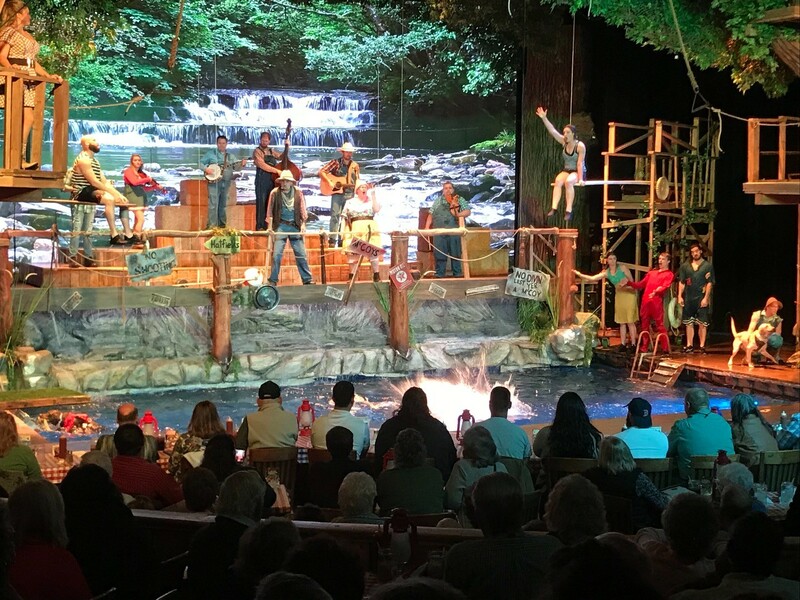 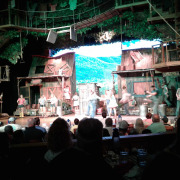 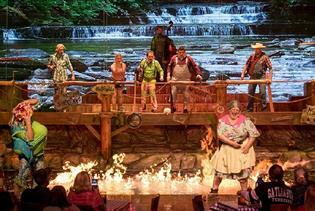 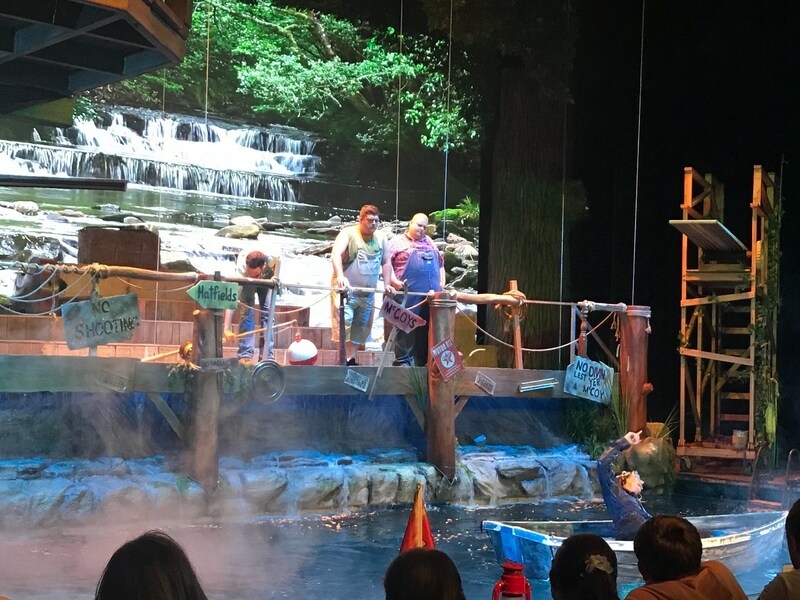 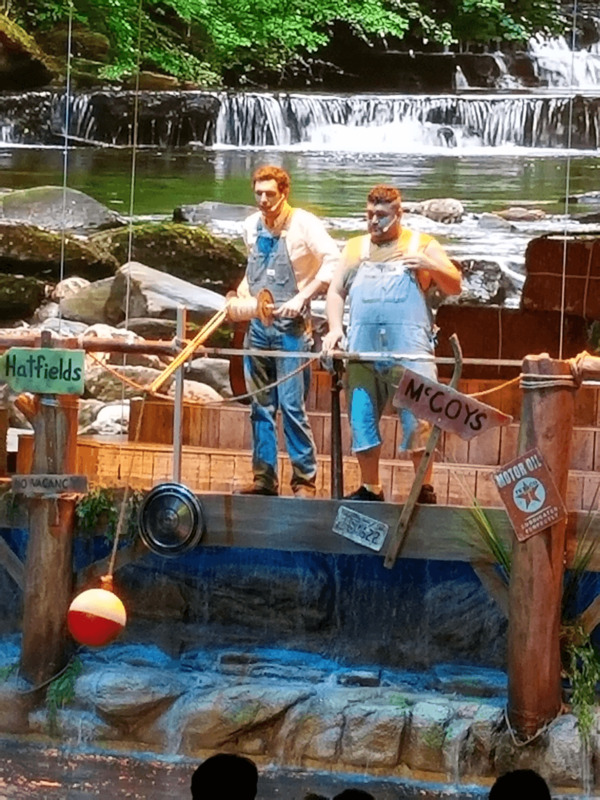 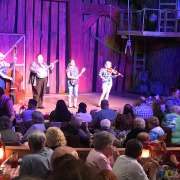 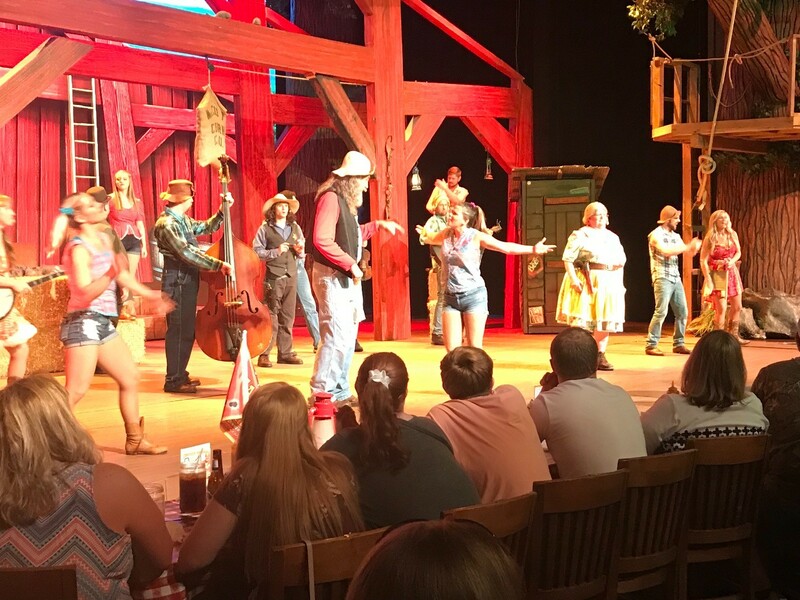 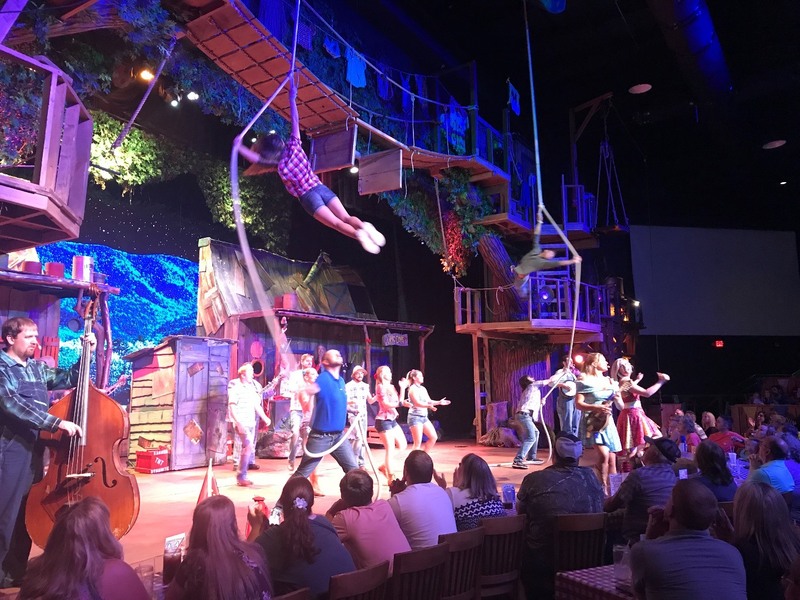 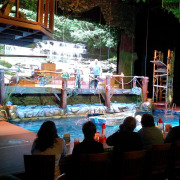 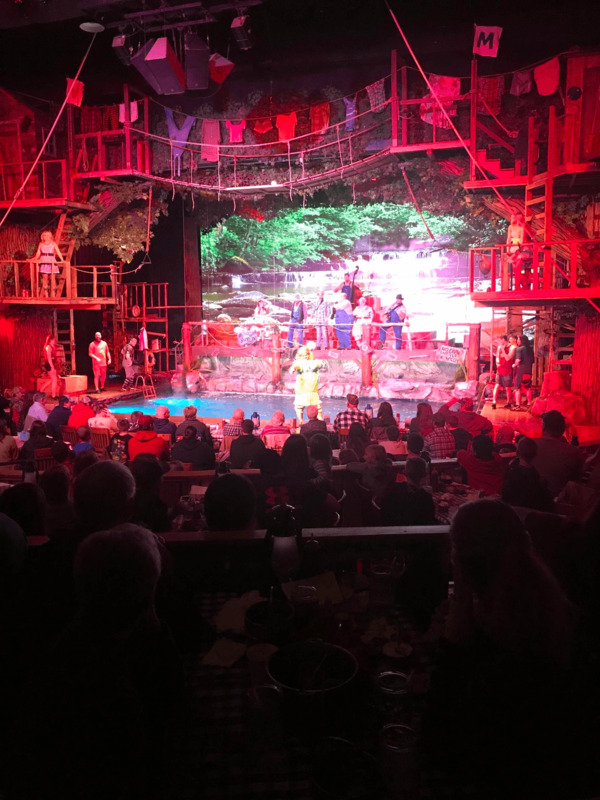 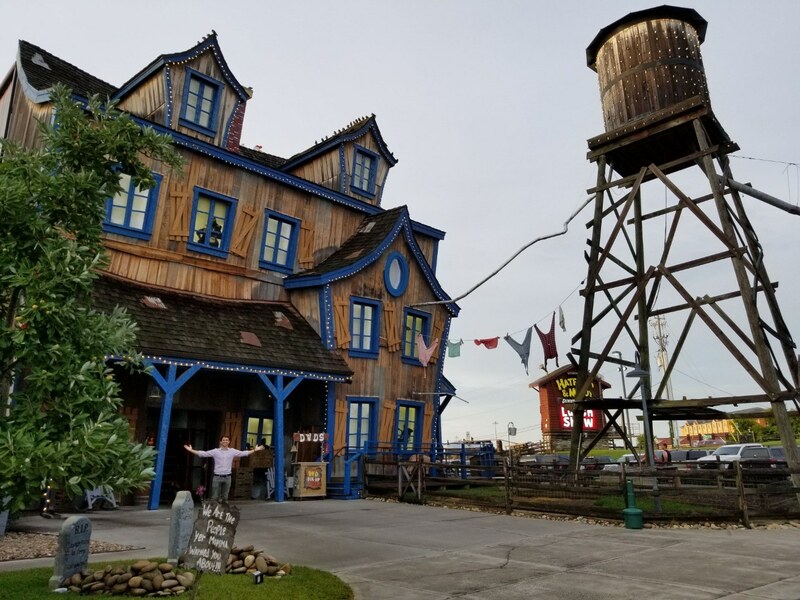 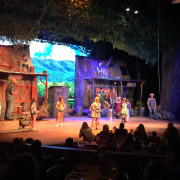 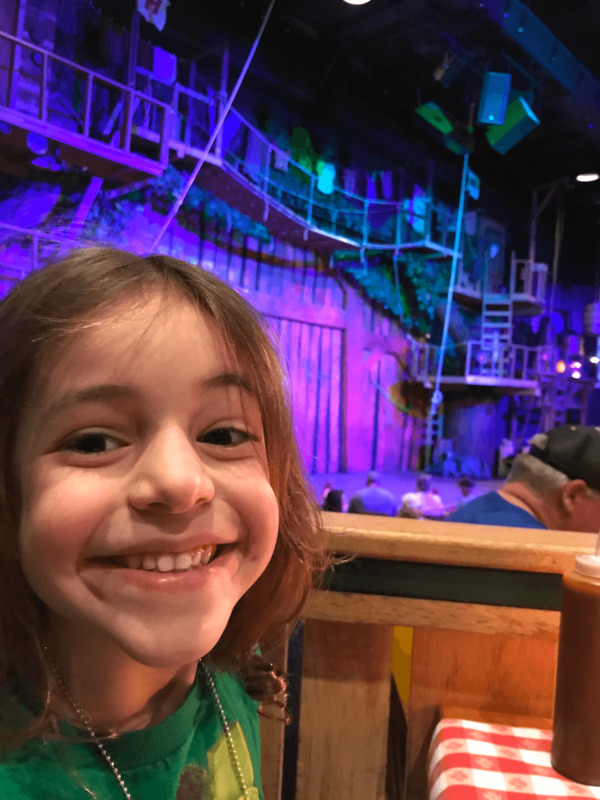 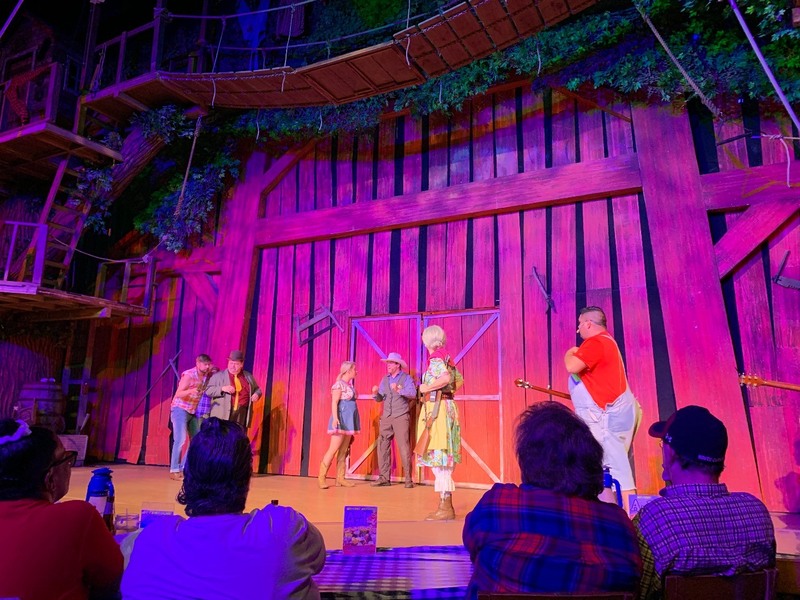 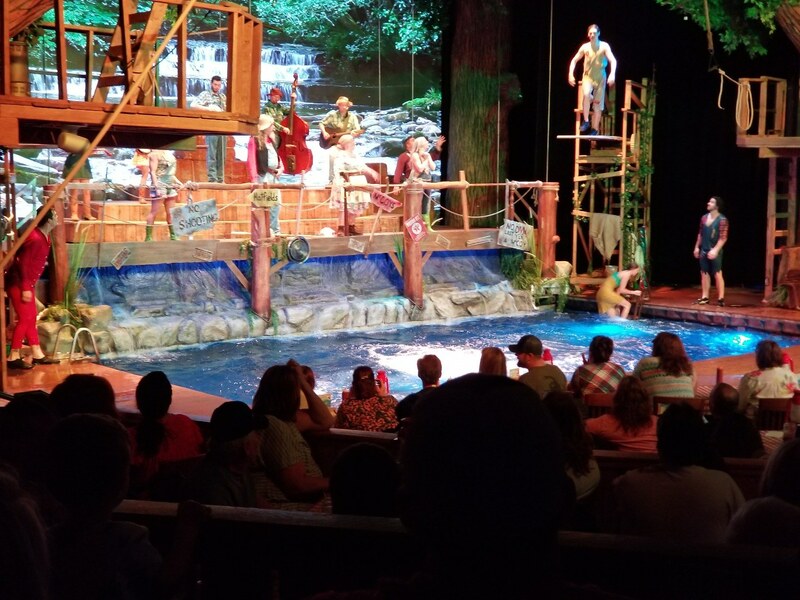 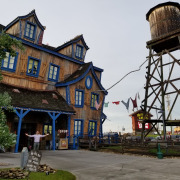 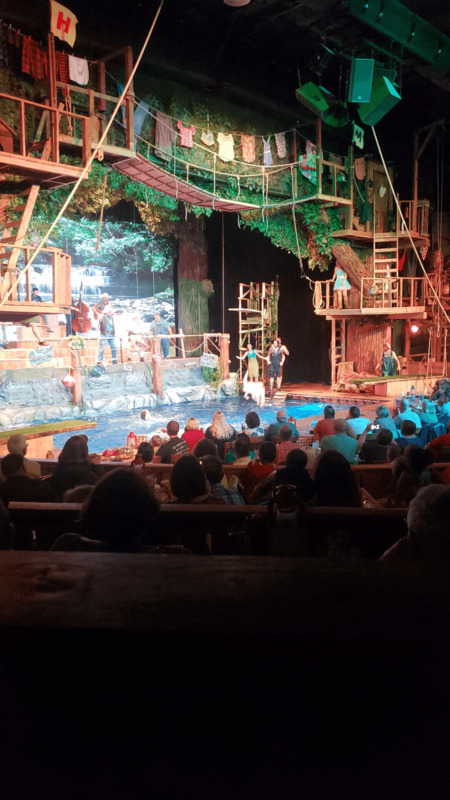 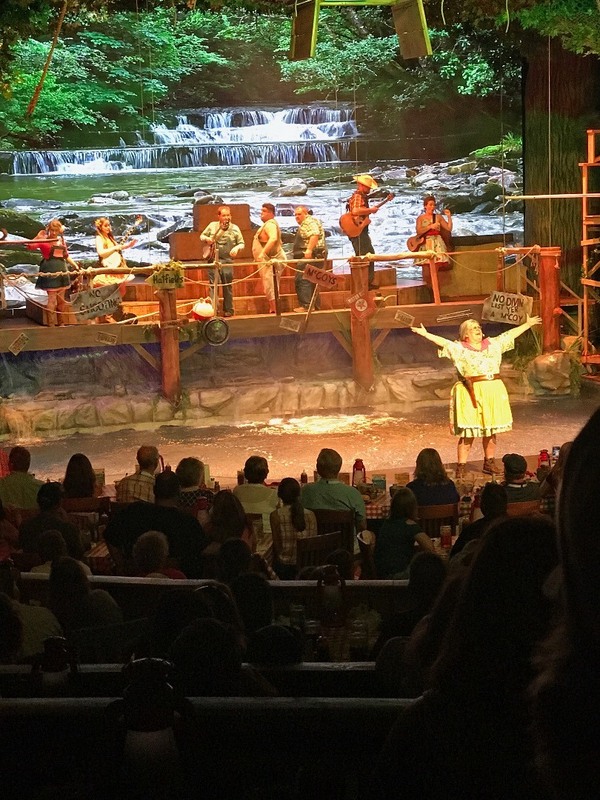 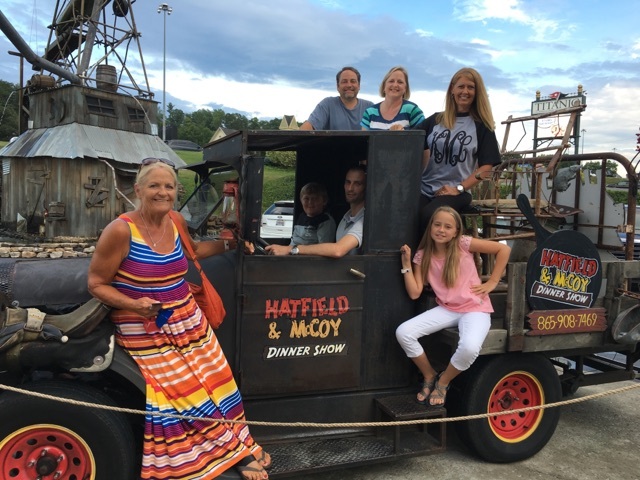 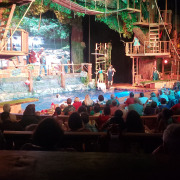 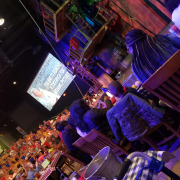 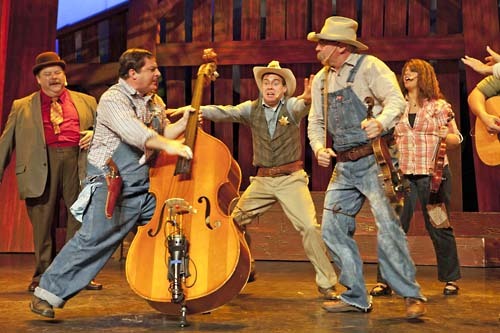 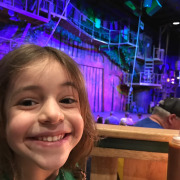 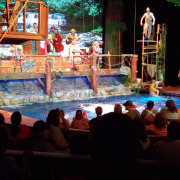 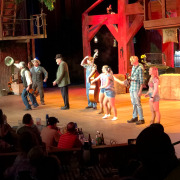 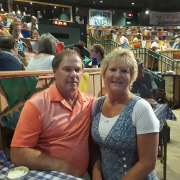 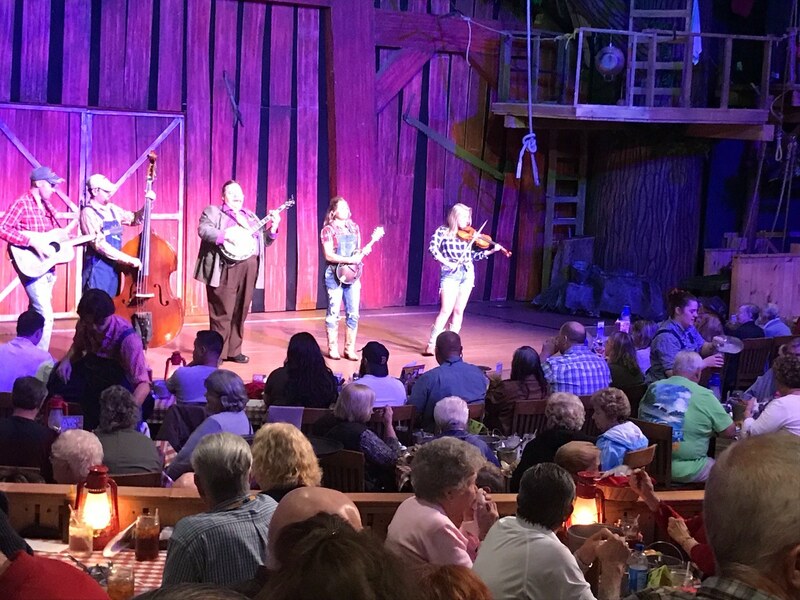 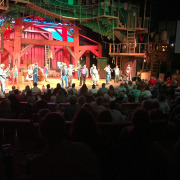 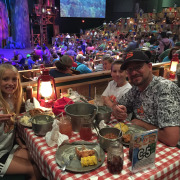 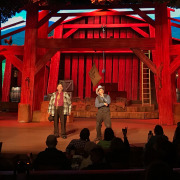 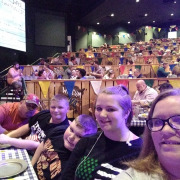 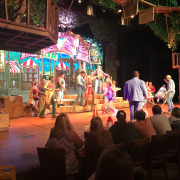 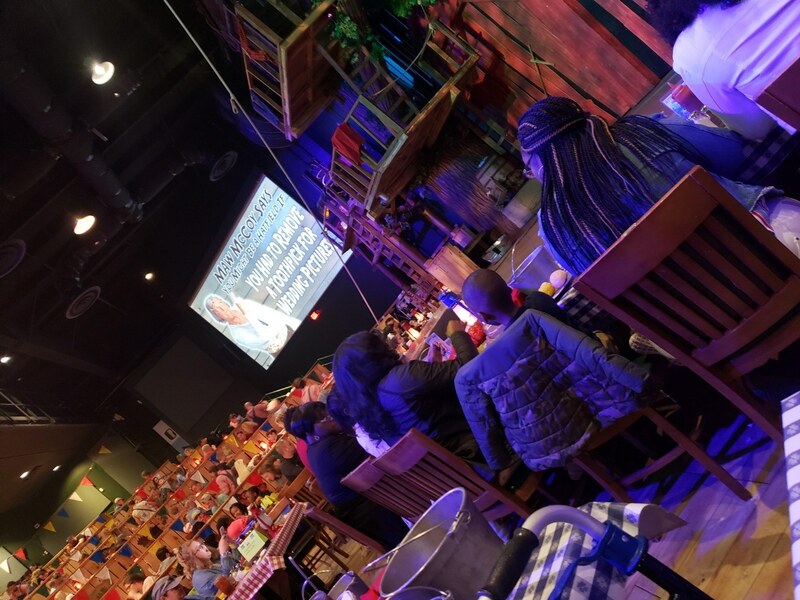 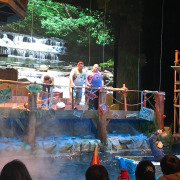 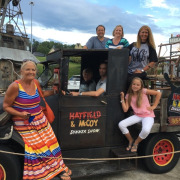 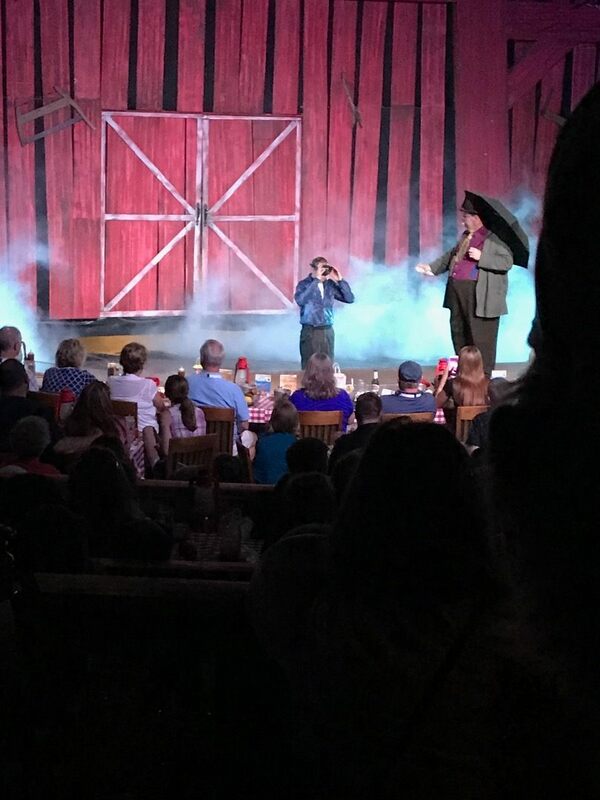 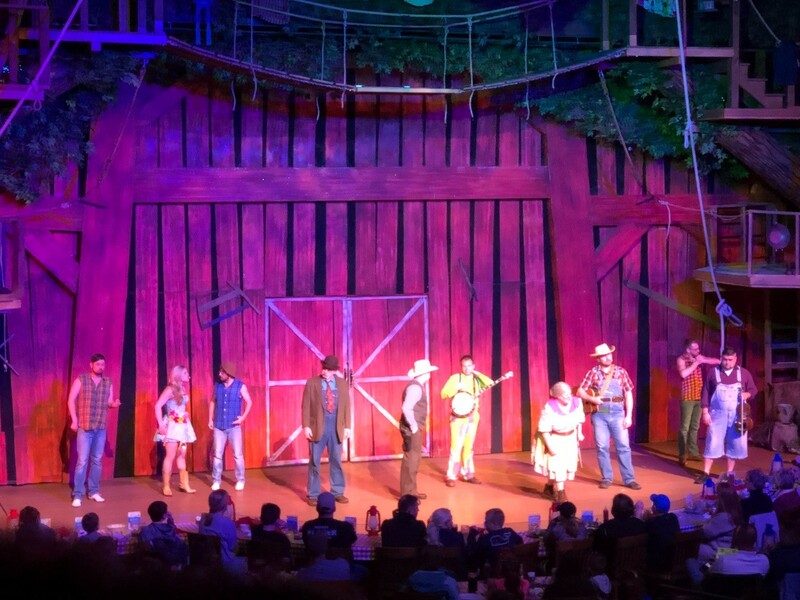 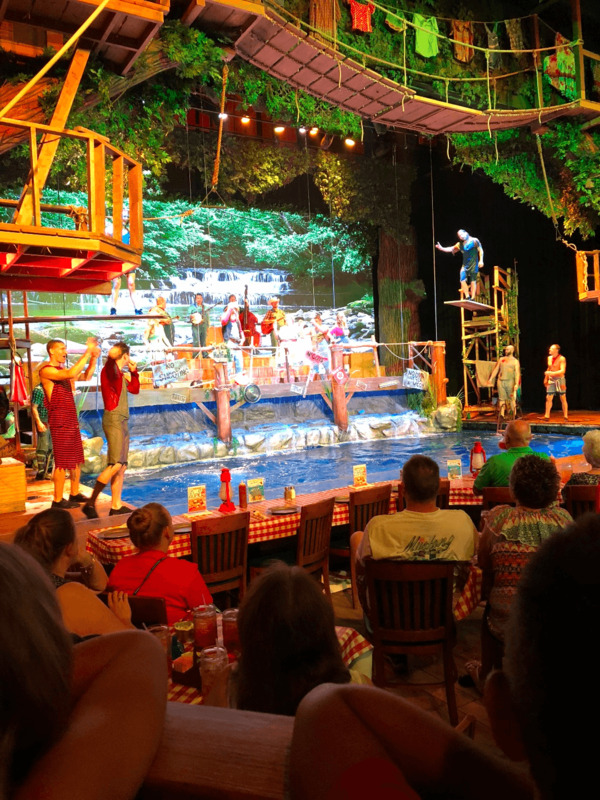 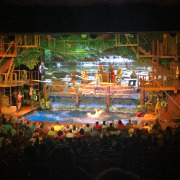 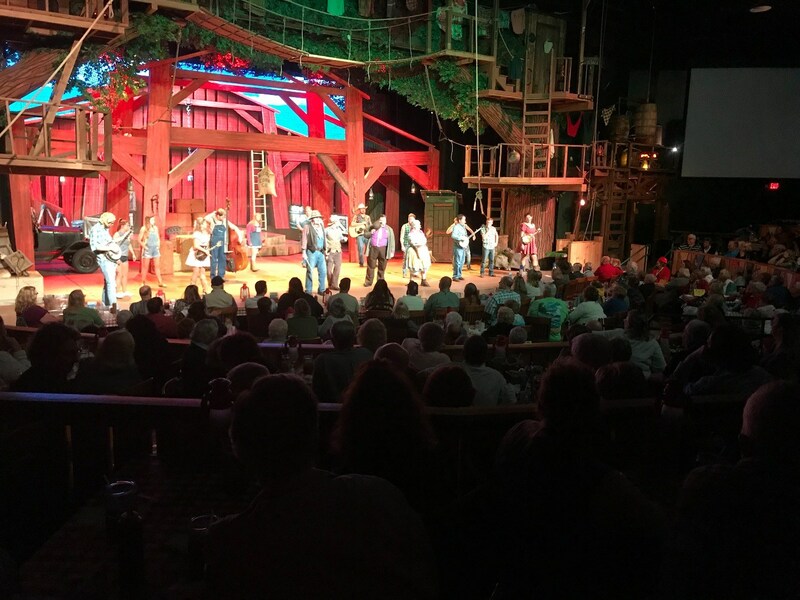 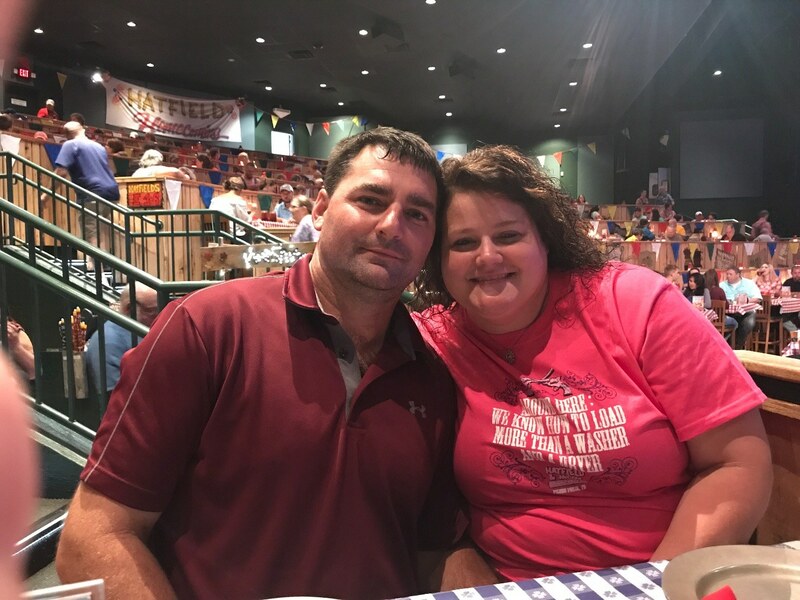 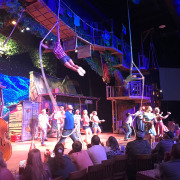 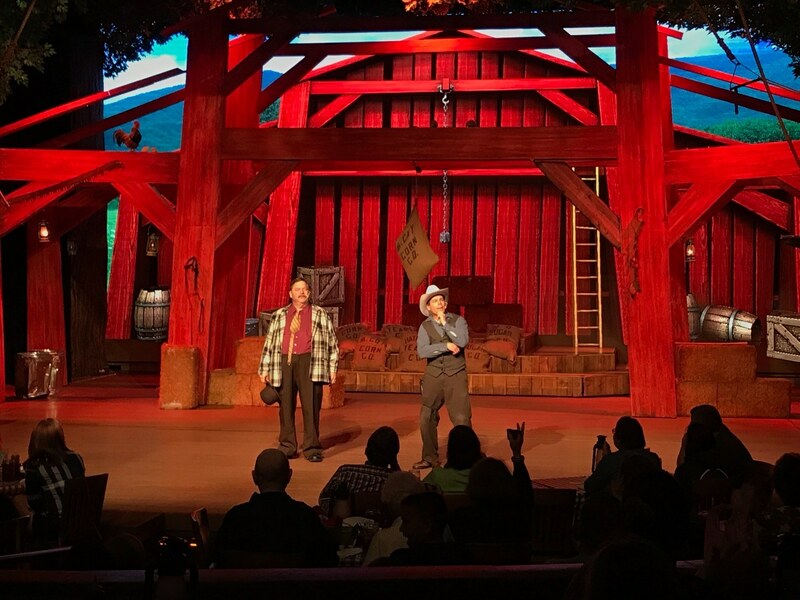 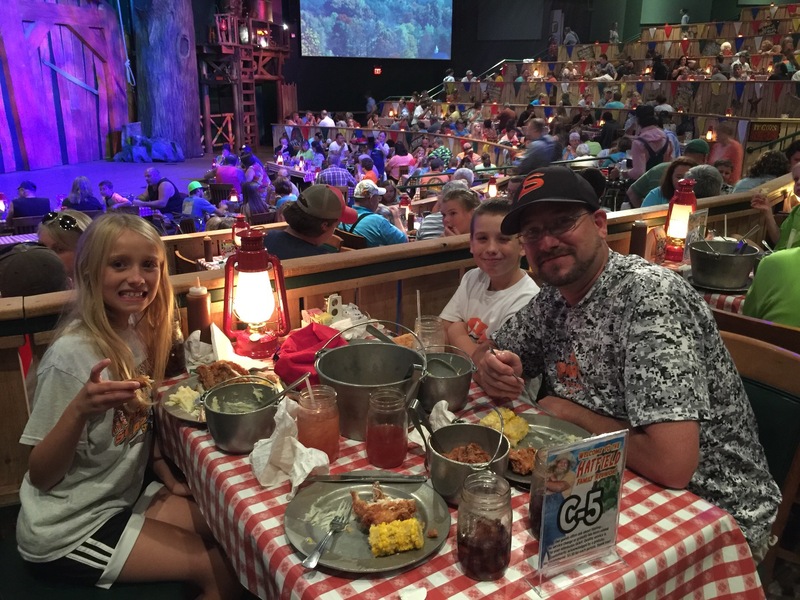 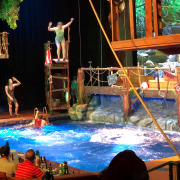 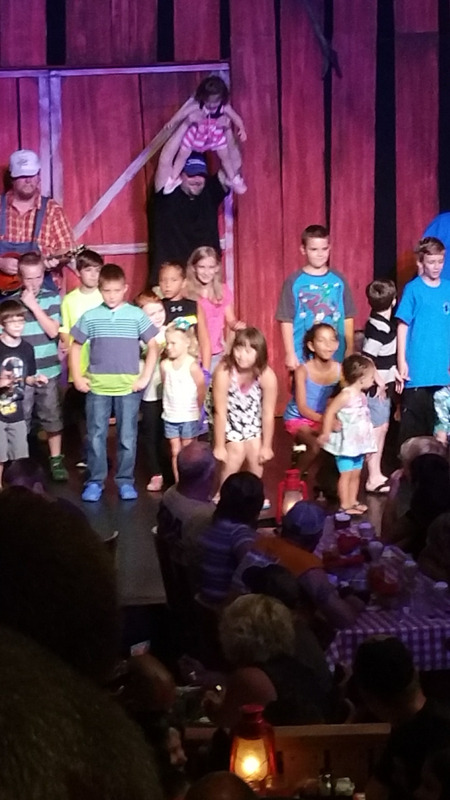 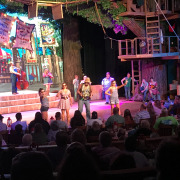 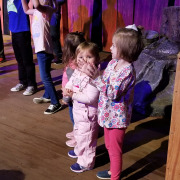 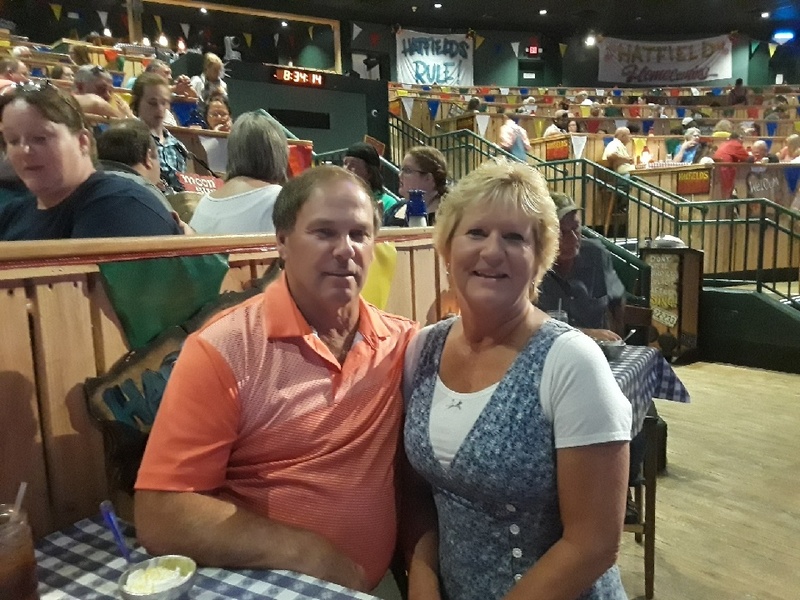 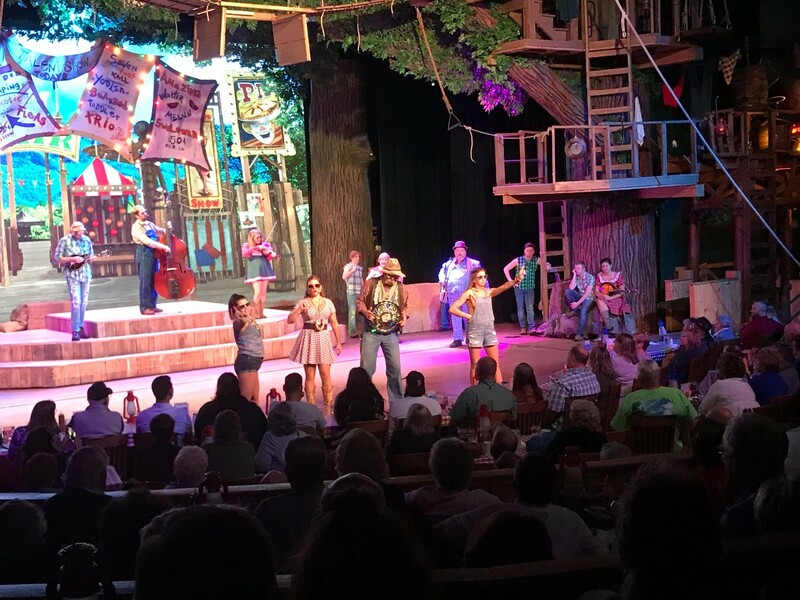 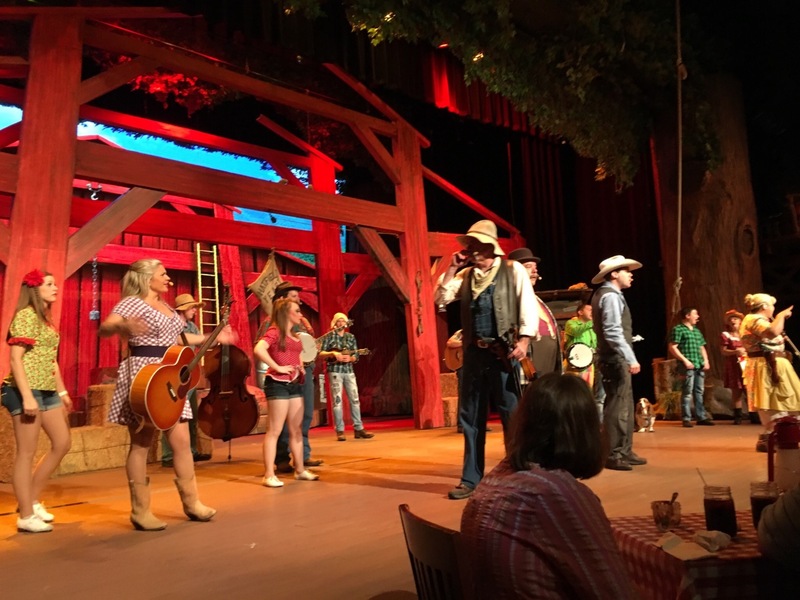 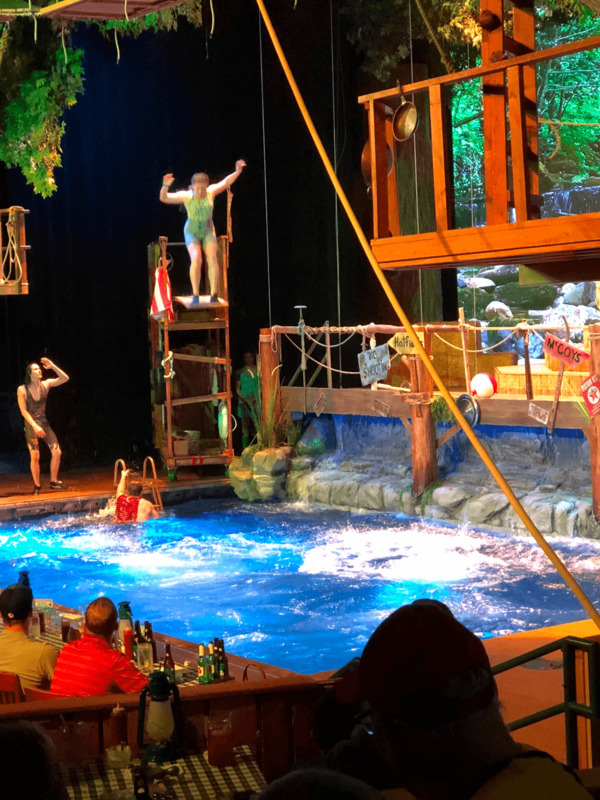 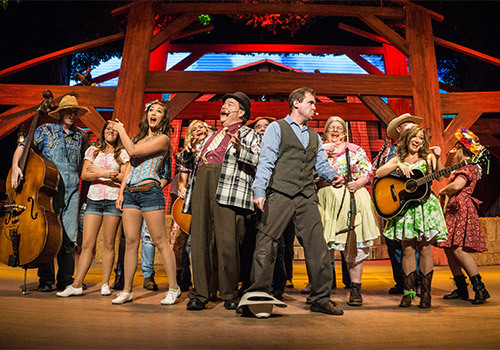 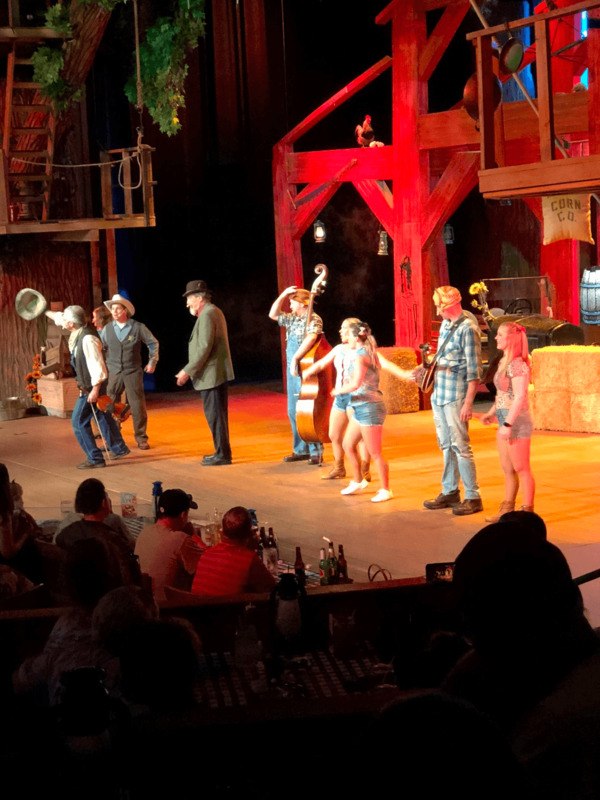 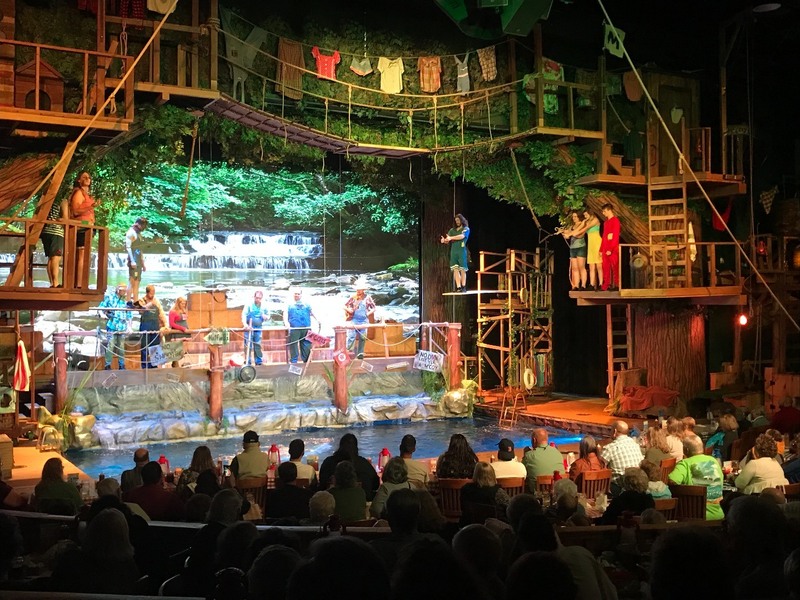 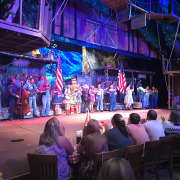 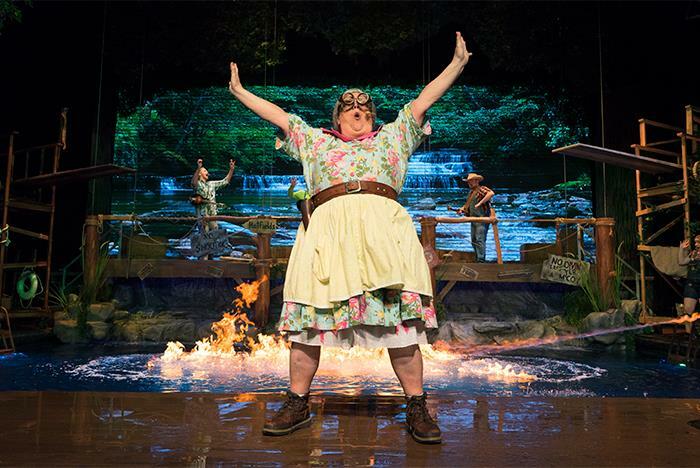 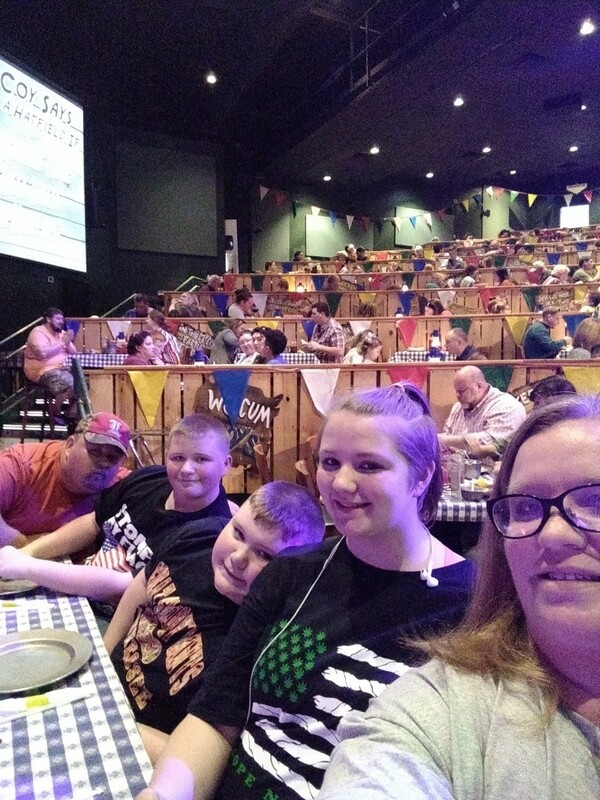 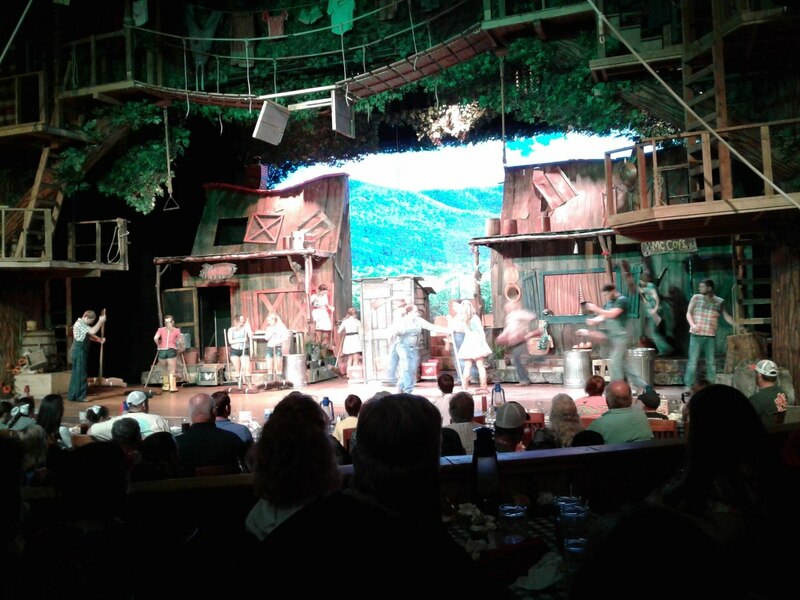 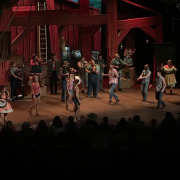 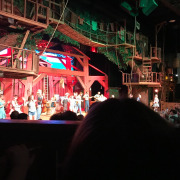 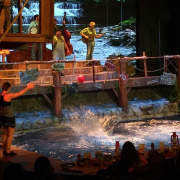 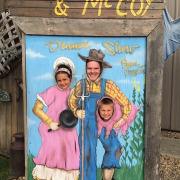 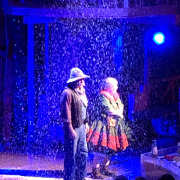 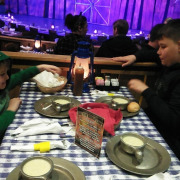 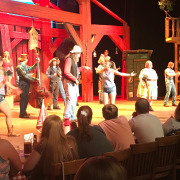 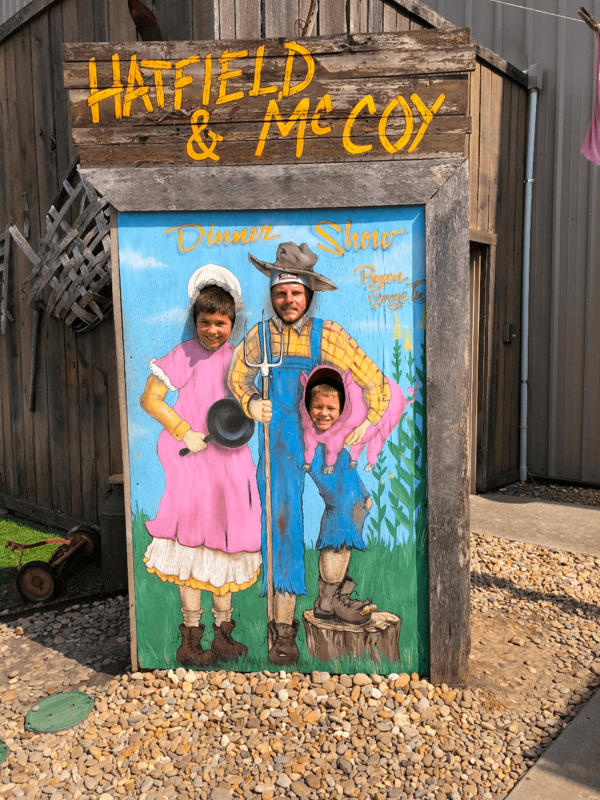 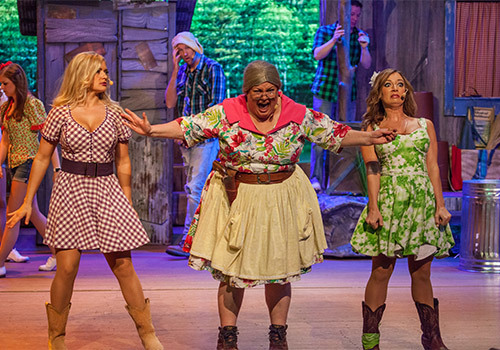 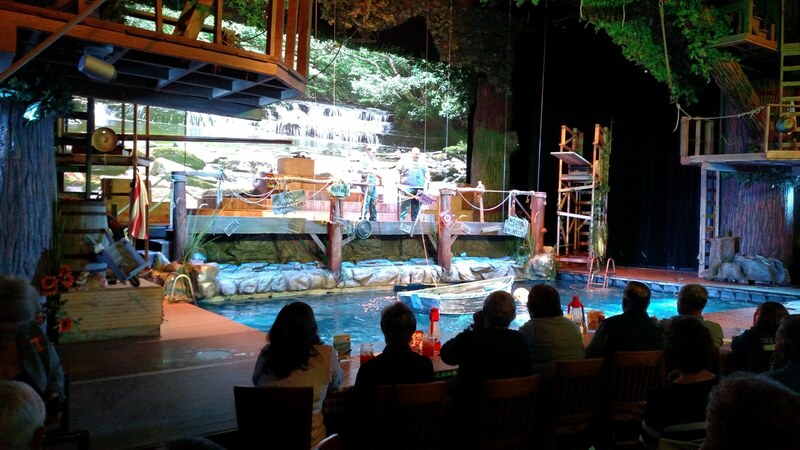 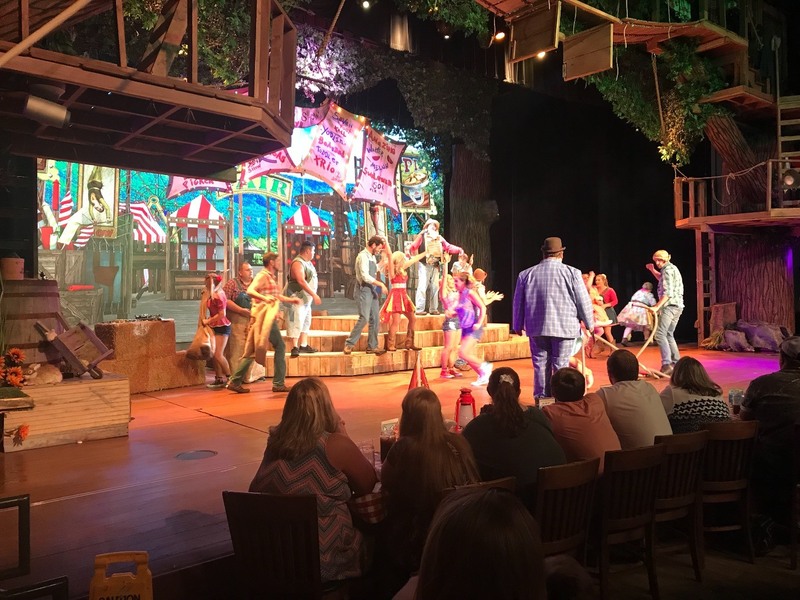 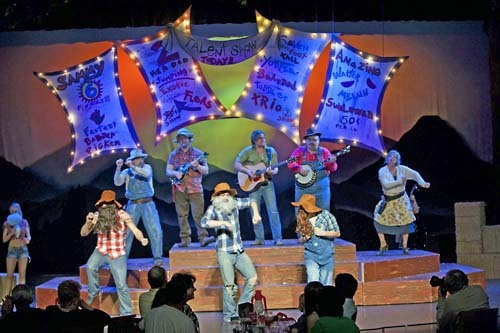 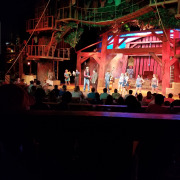 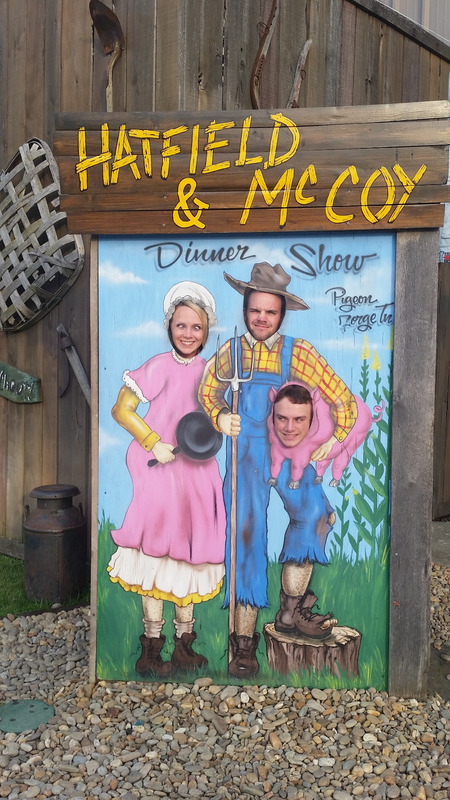 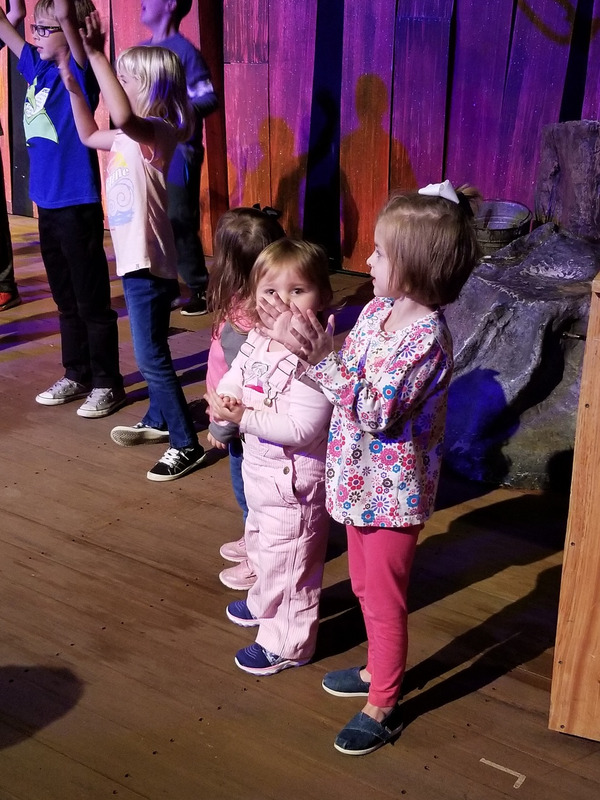 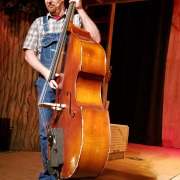 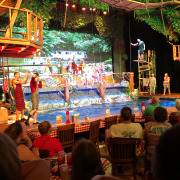 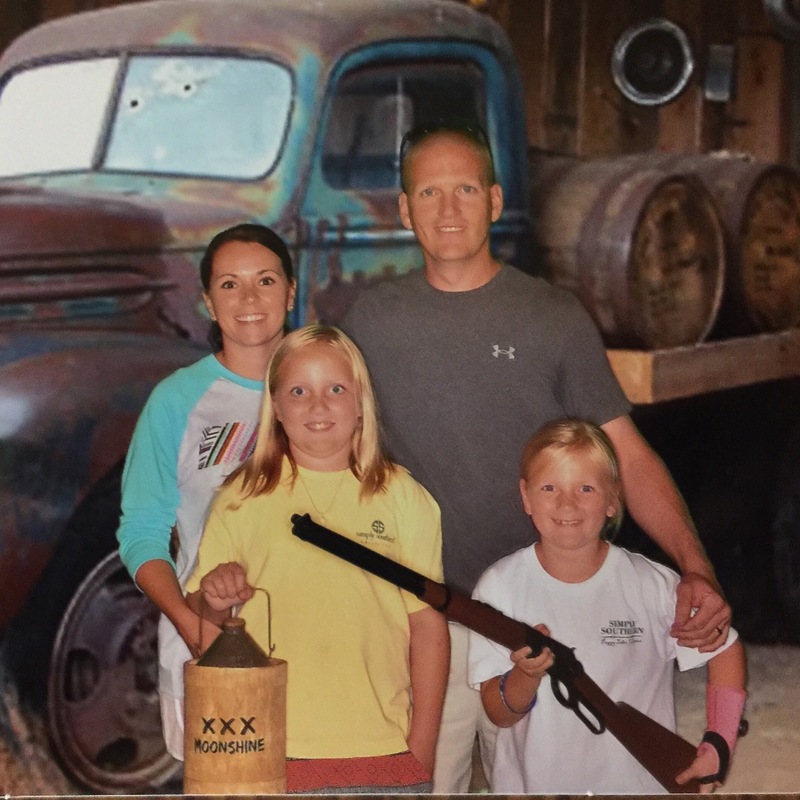 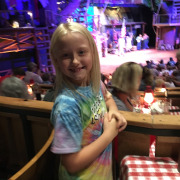 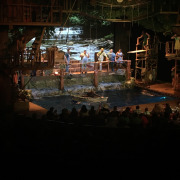 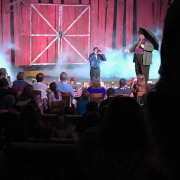 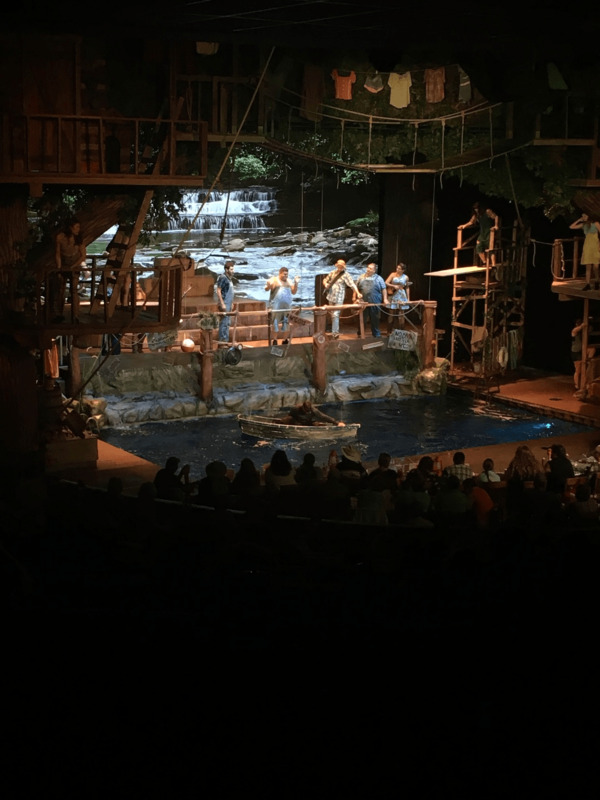 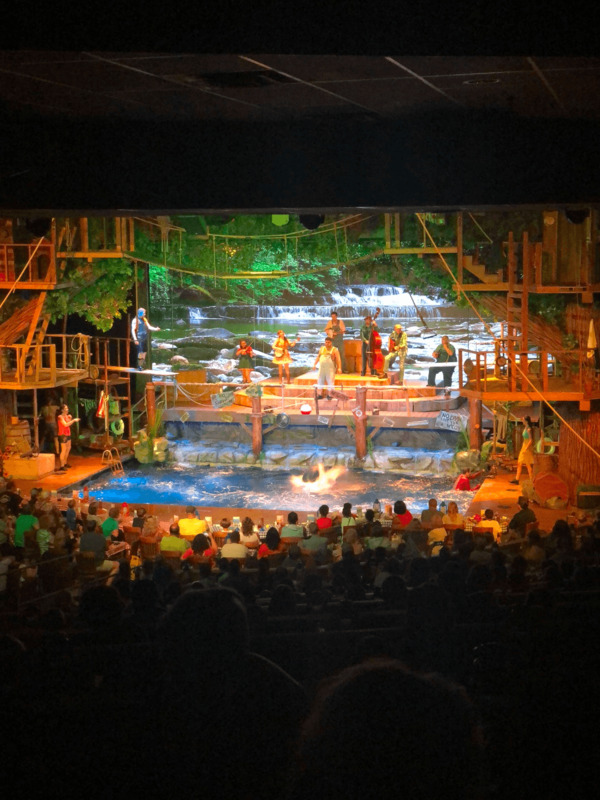 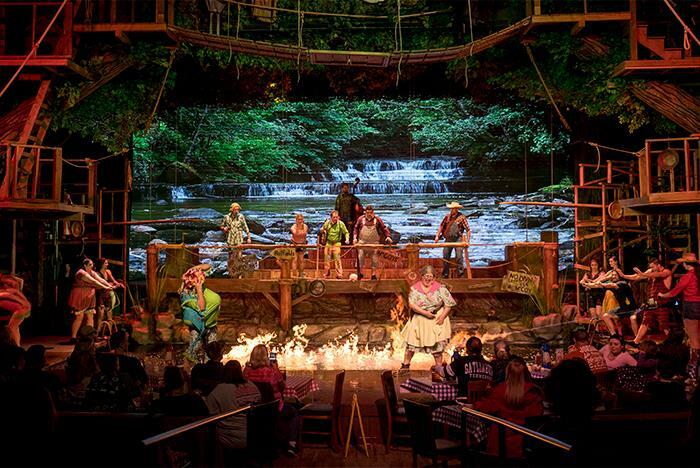 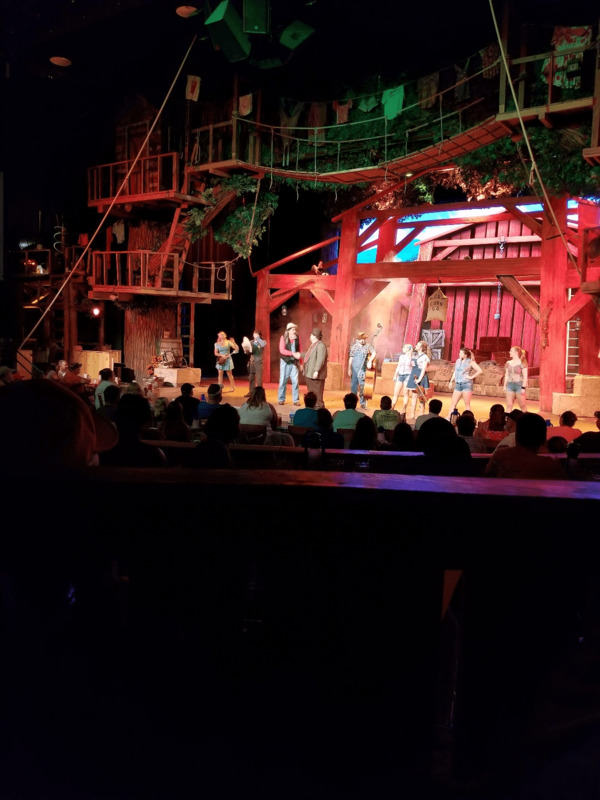 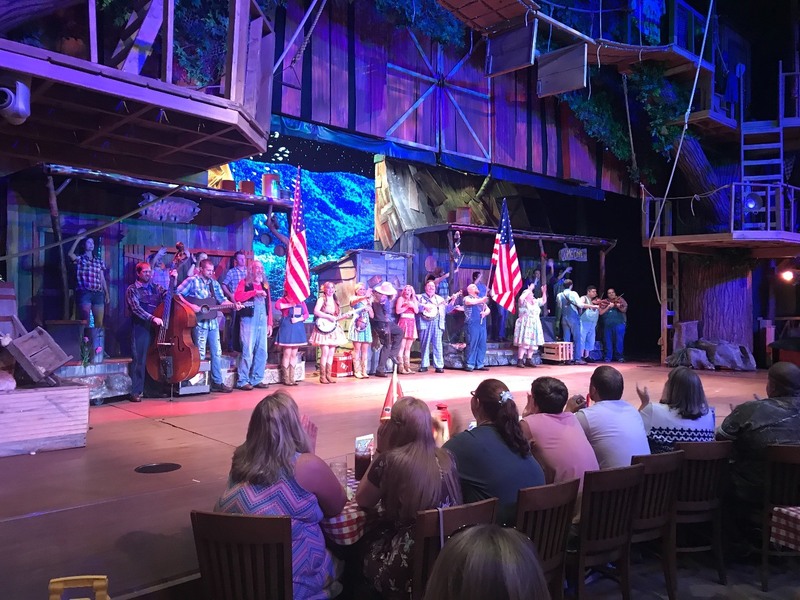 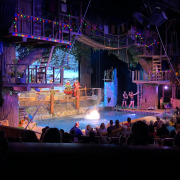 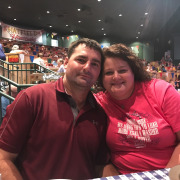 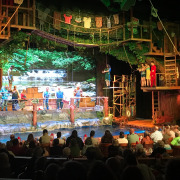 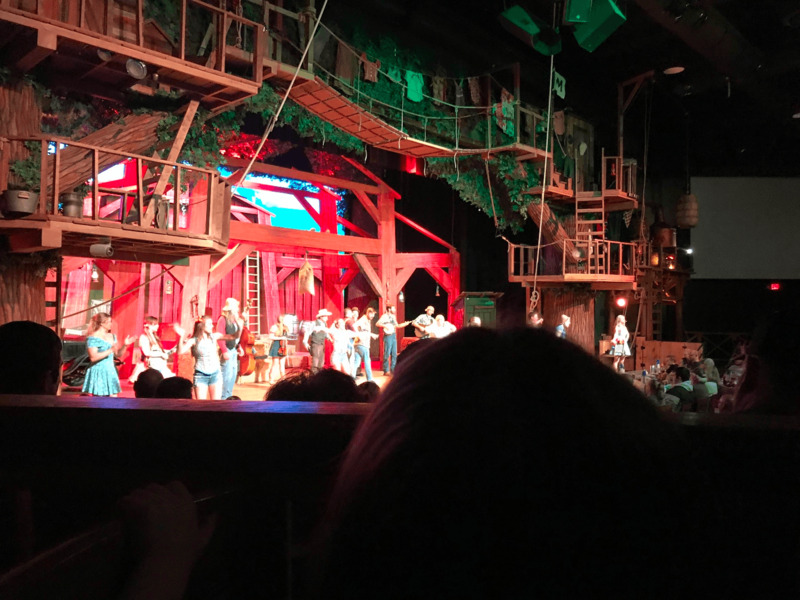 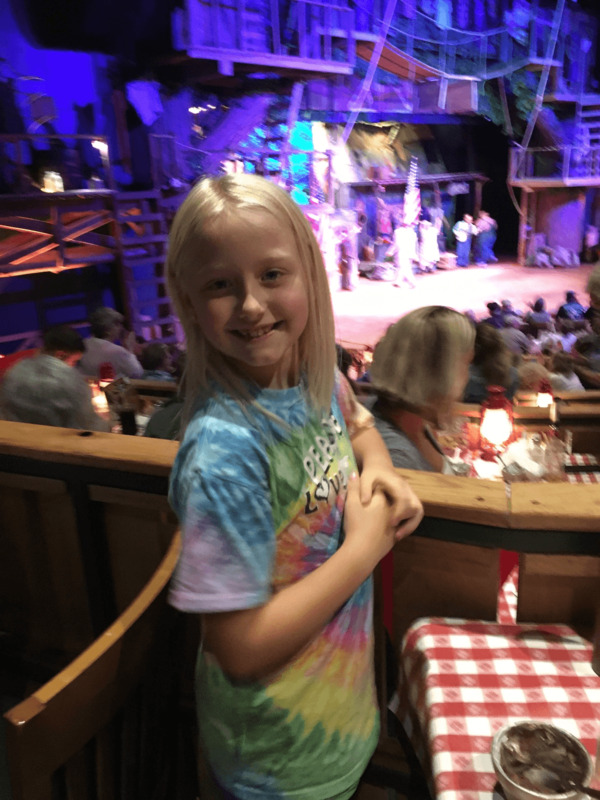 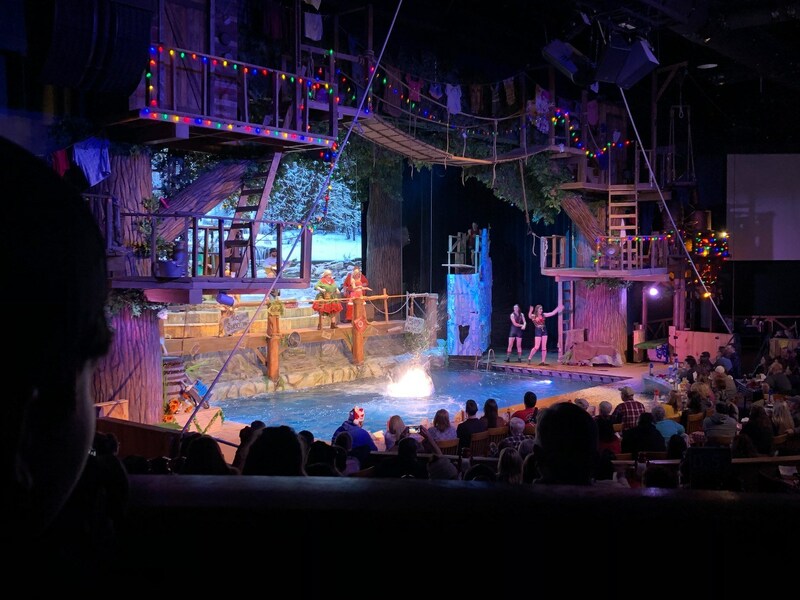 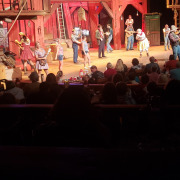 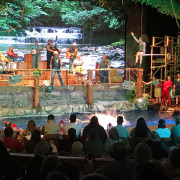 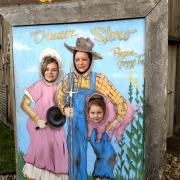 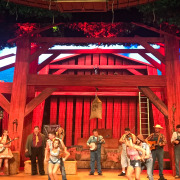 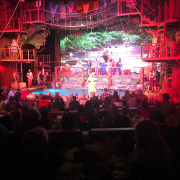 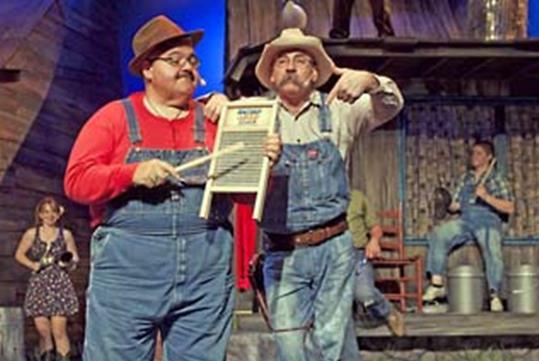 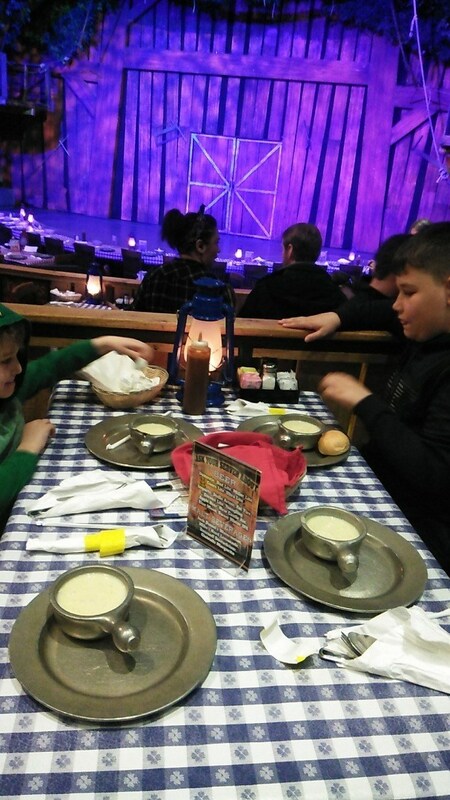 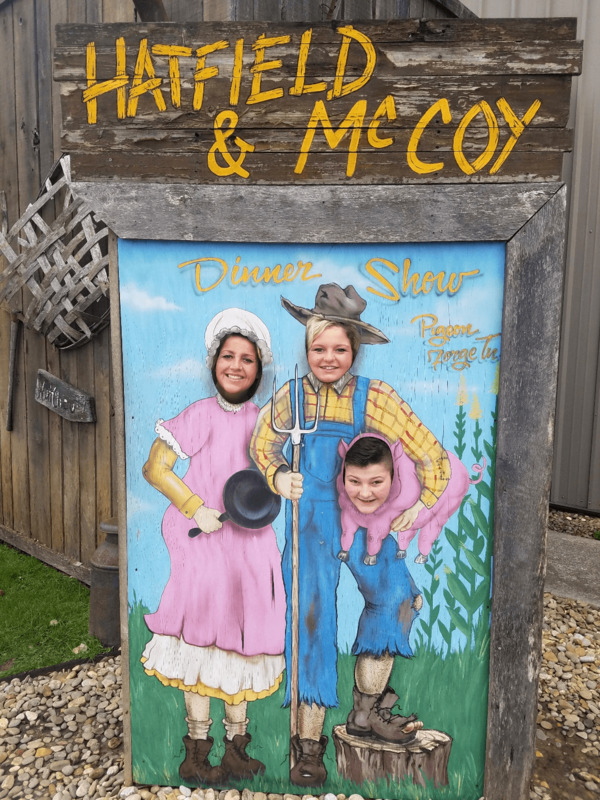 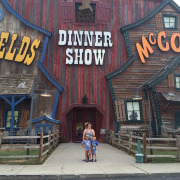 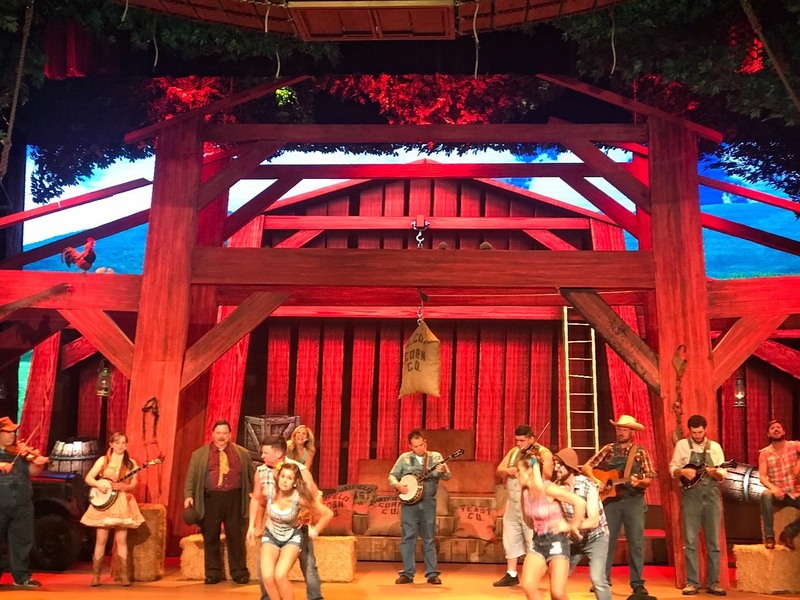 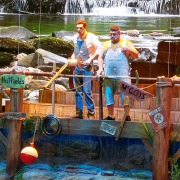 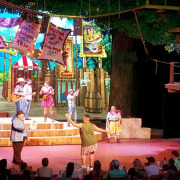 An exciting two-hour dinner show in Pigeon Forge, Hatfield & McCoy Dinner Show offers a fun experience, complete with singing, dancing, heavy lifting, pretend fighting, comedy bits, and other outrageous entertainment routines. 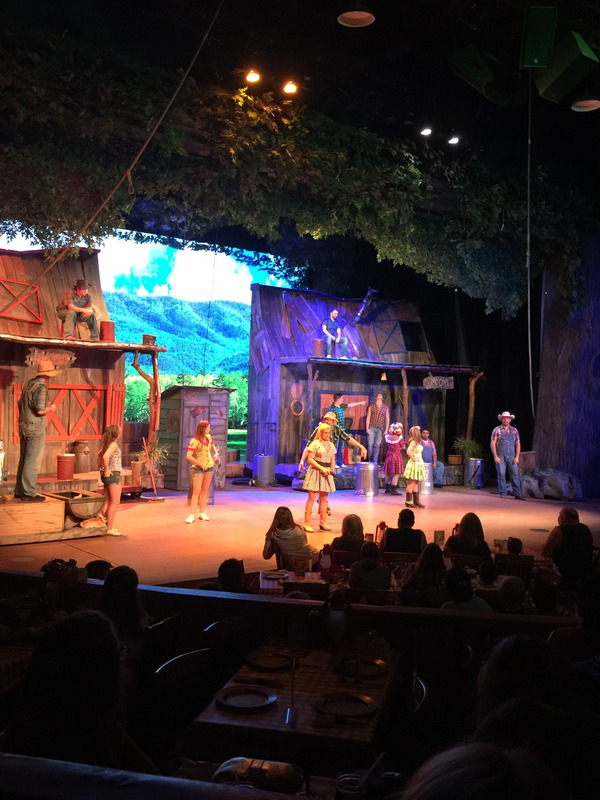 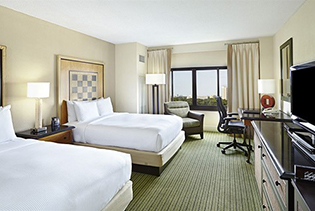 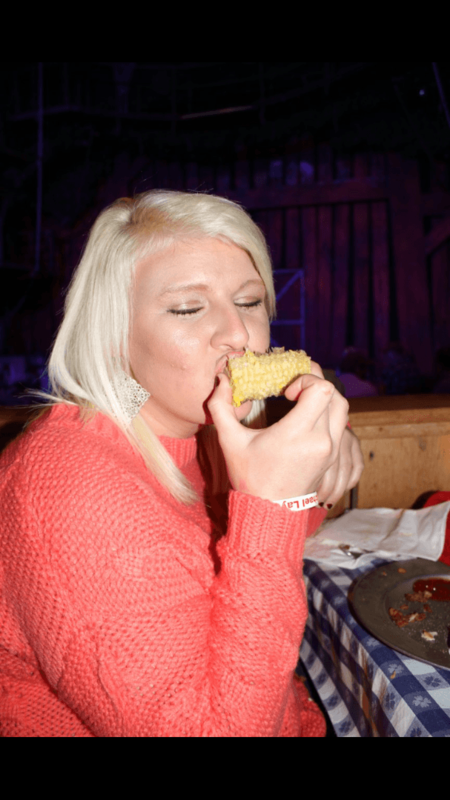 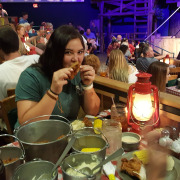 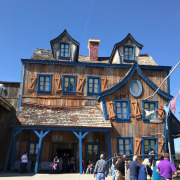 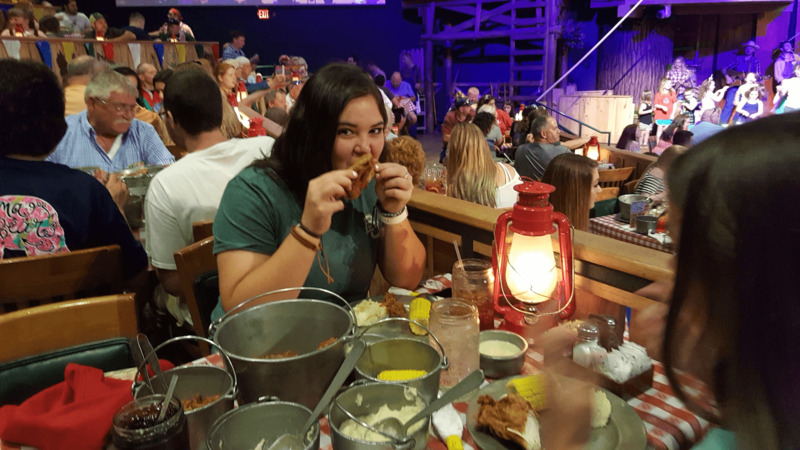 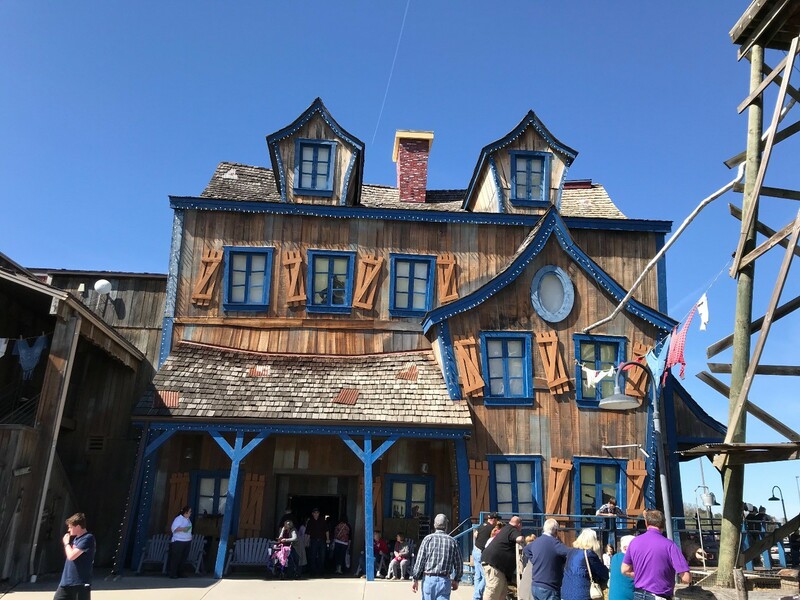 Guests can enjoy the show while also enjoying a Southern-style feast, including fried chicken, barbecue pork, mashed potatoes, dessert, and more. 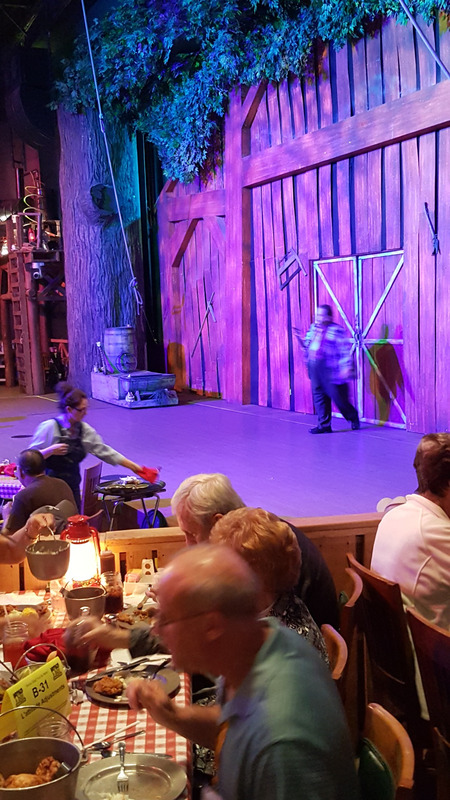 Meals are served before the show starts, so arrive at least 30 minutes prior to show time. 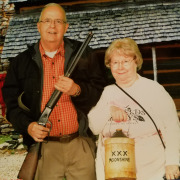 Remember to bring cash for tip, souvenir photo, beer, or moonshine cocktails as they are not included in the ticket price. 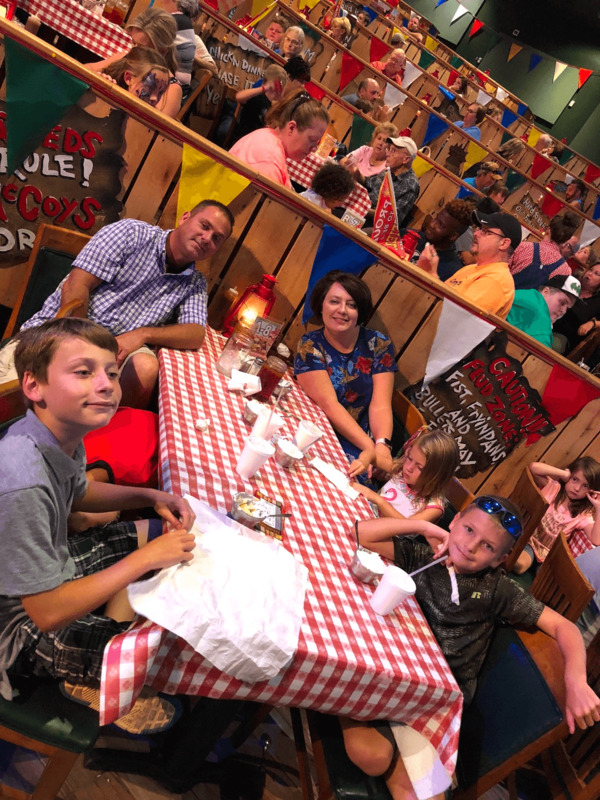 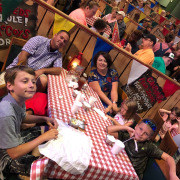 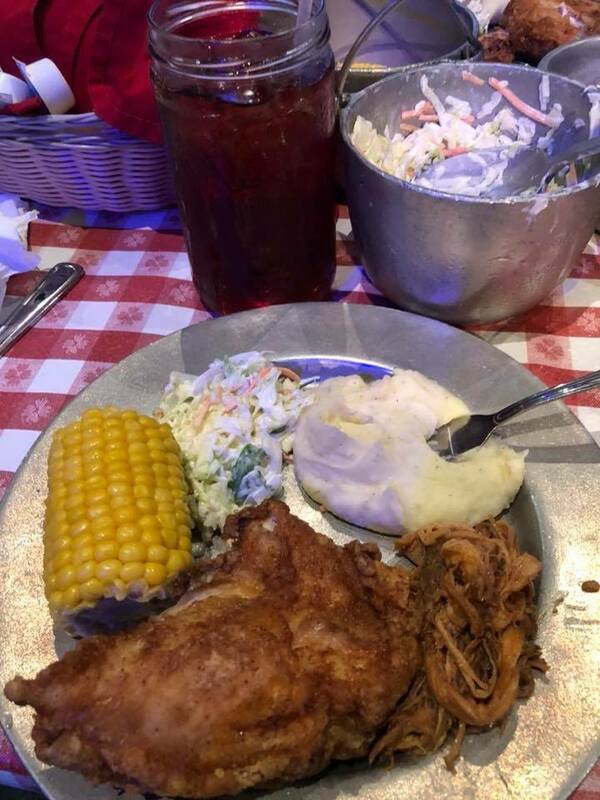 Come hungry, because it's "all you can eat" served family style. 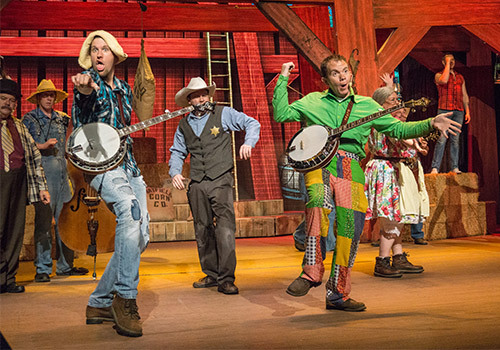 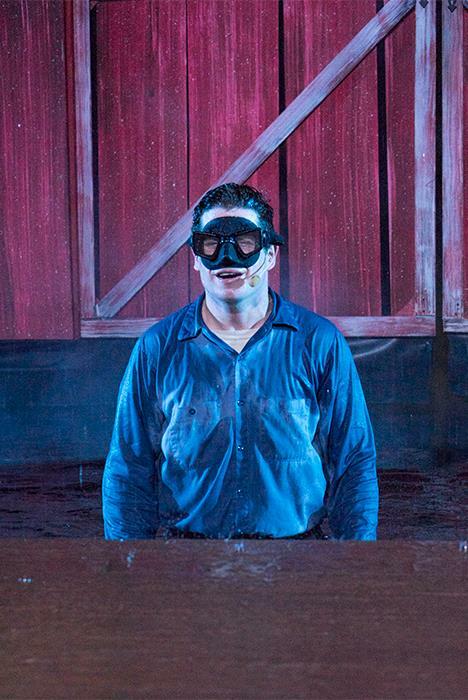 Features a Bluegrass band, jaw dropping stunts, and hilarious comedy. 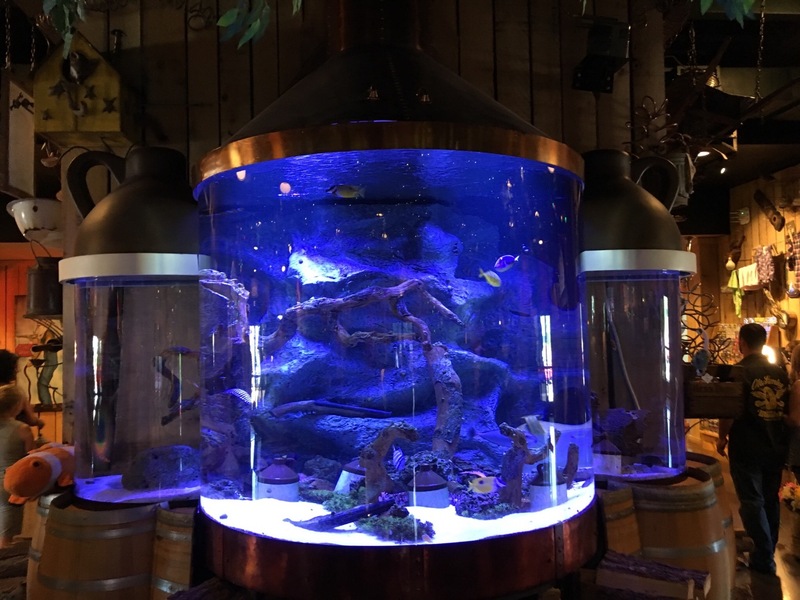 The lobby includes a new aquarium constructed by Acrylic Tank Manufacturing of Las Vegas as seen on Animal Planet's Tanked. 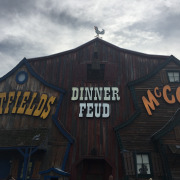 Feud! 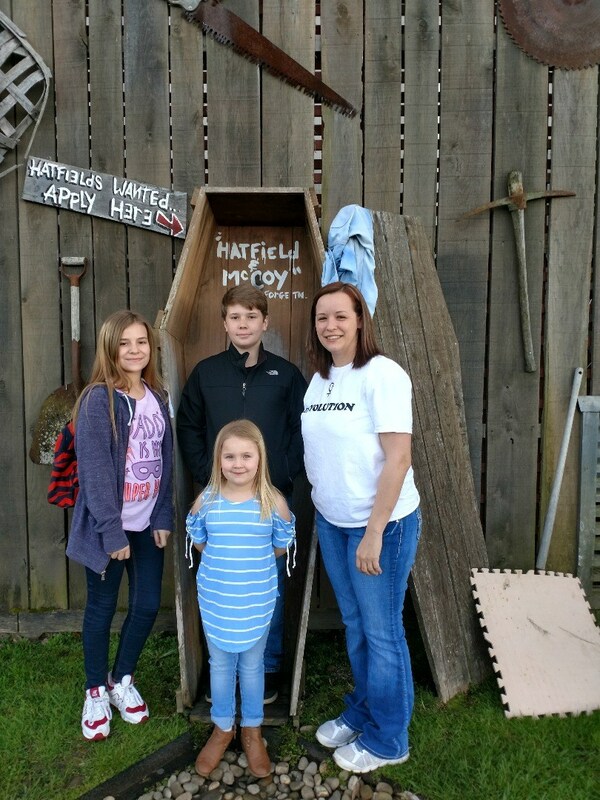 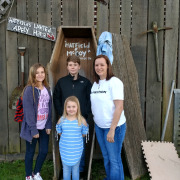 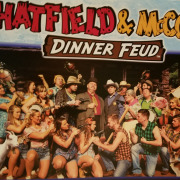 Become part of the longest running feud in history and help the Hatfields and McCoys try to settle their differences mountain-style. 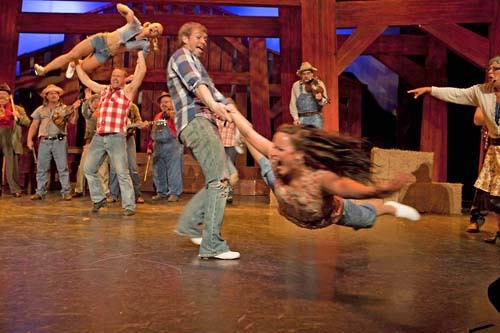 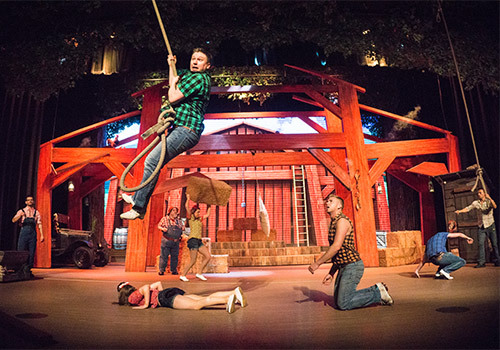 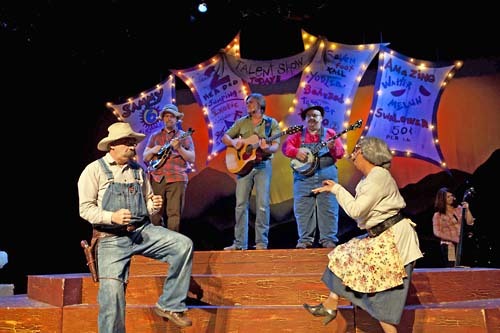 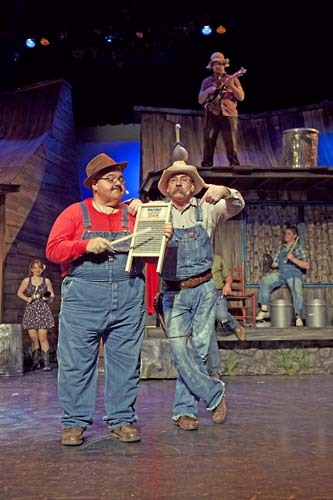 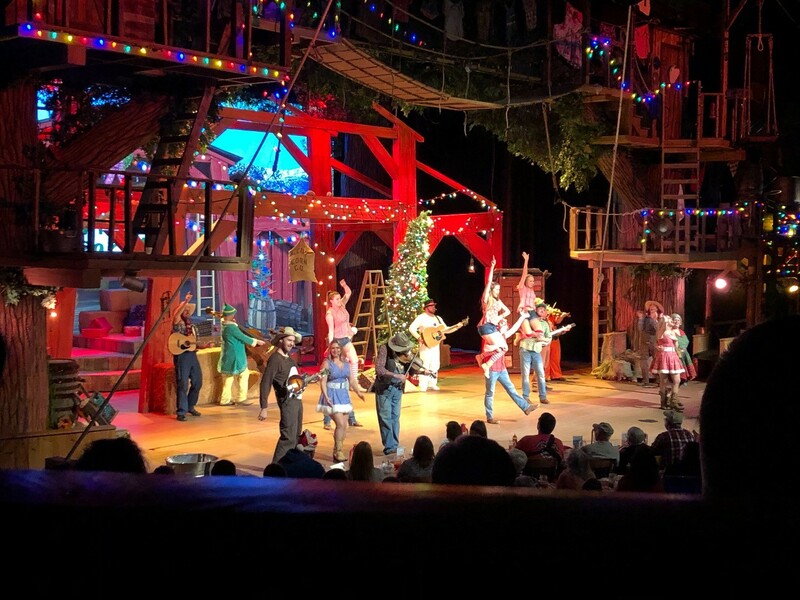 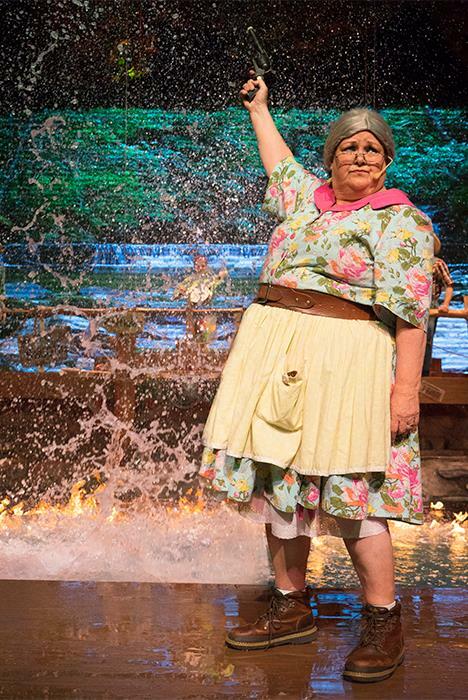 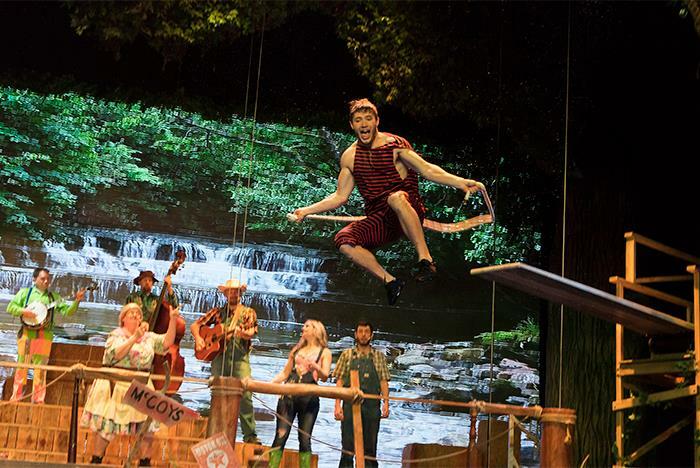 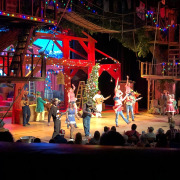 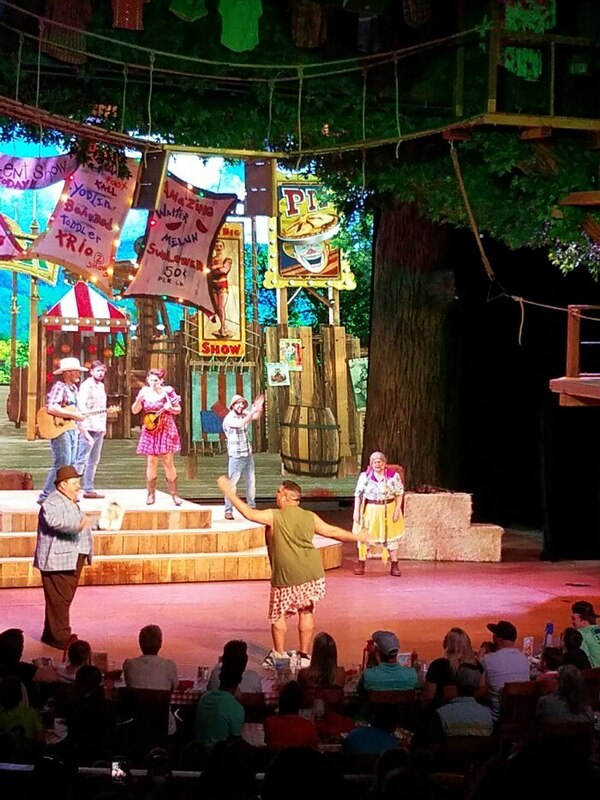 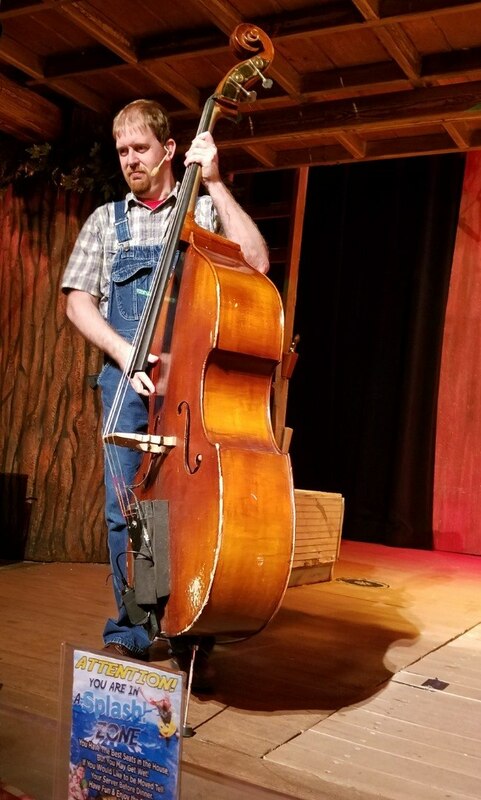 Whether you’re city-folk or country cuzins, you’ll love the singin' and dancin', mighty feats of strength, jaw dropping stunts and side-splitting comedy. 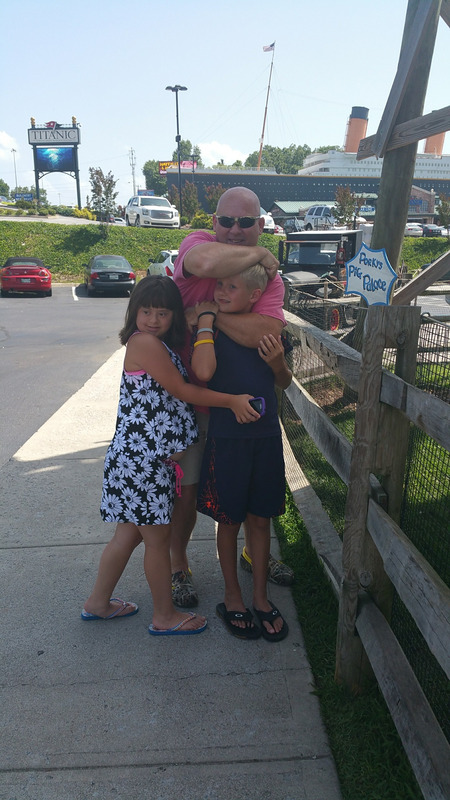 The chaos doesn't stop with fightin' cousins! 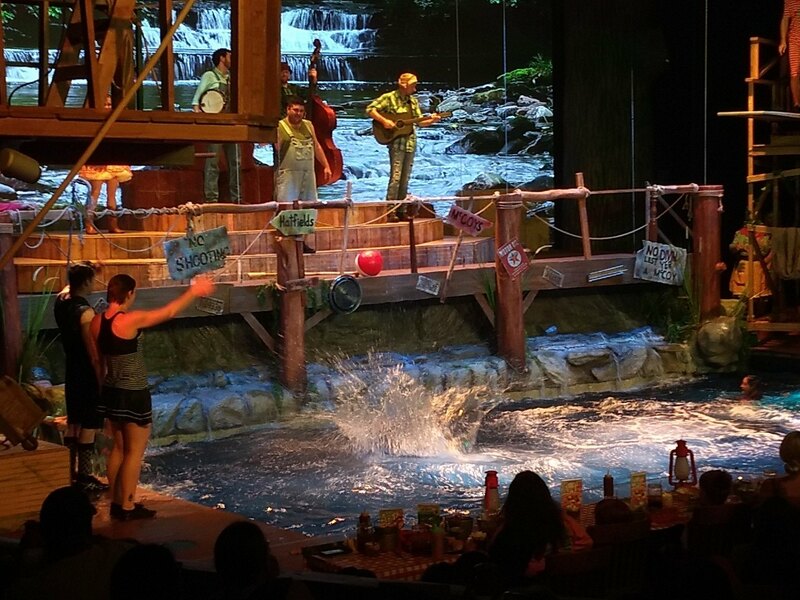 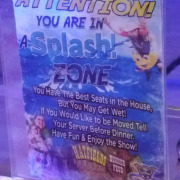 You'll watch divin’ Hillbillies and divin' dogs, - in our brand new swimmin’ hole! 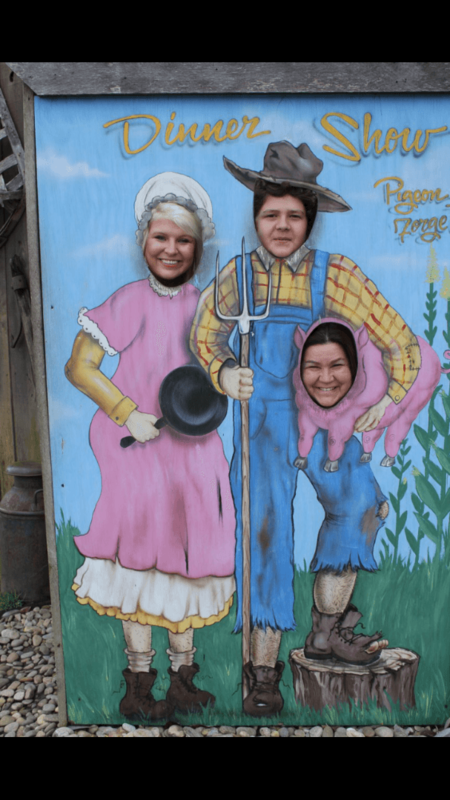 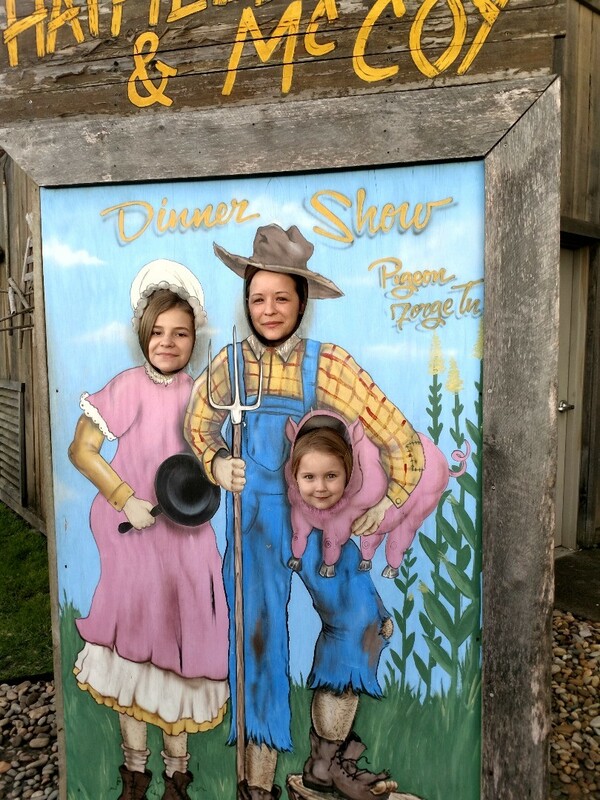 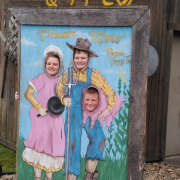 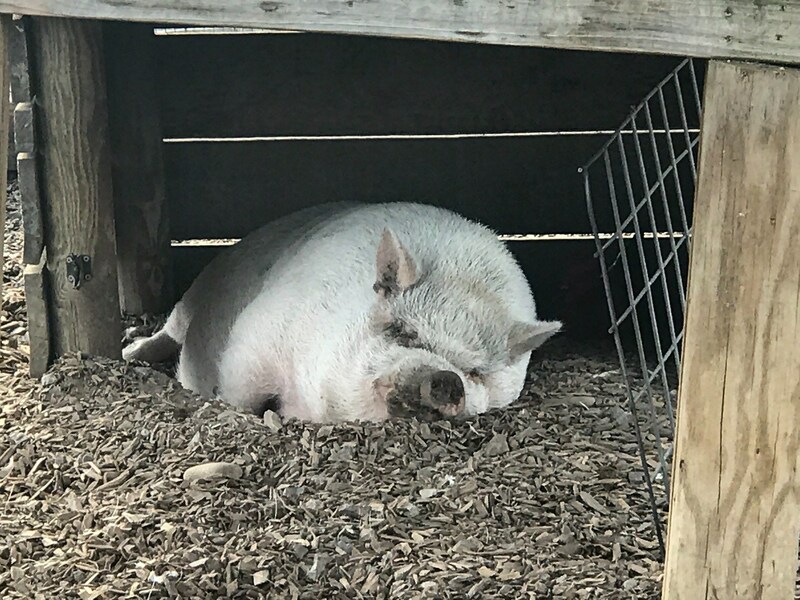 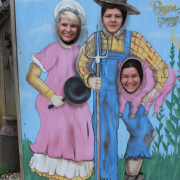 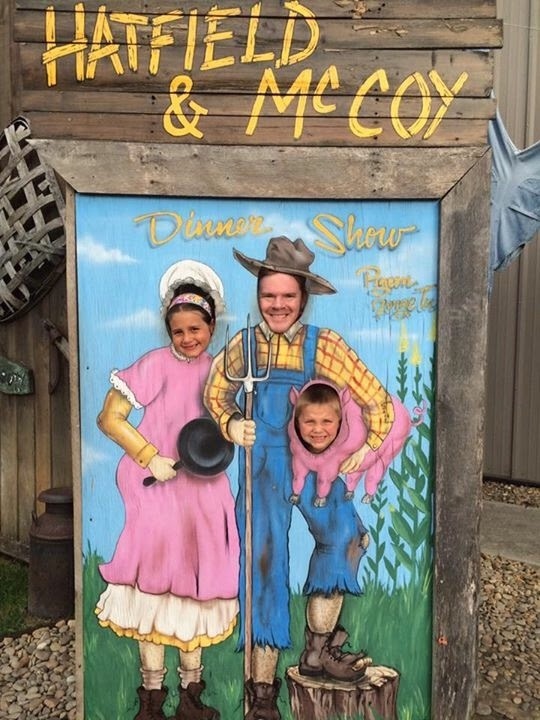 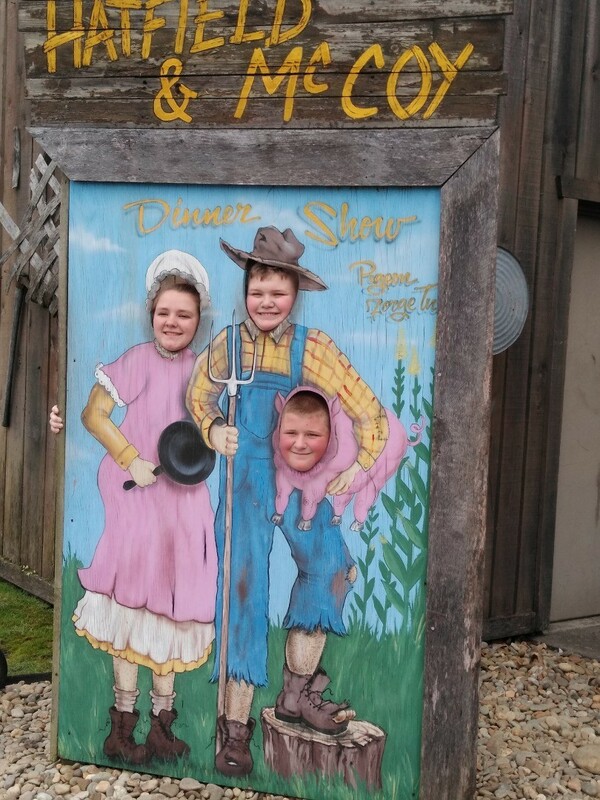 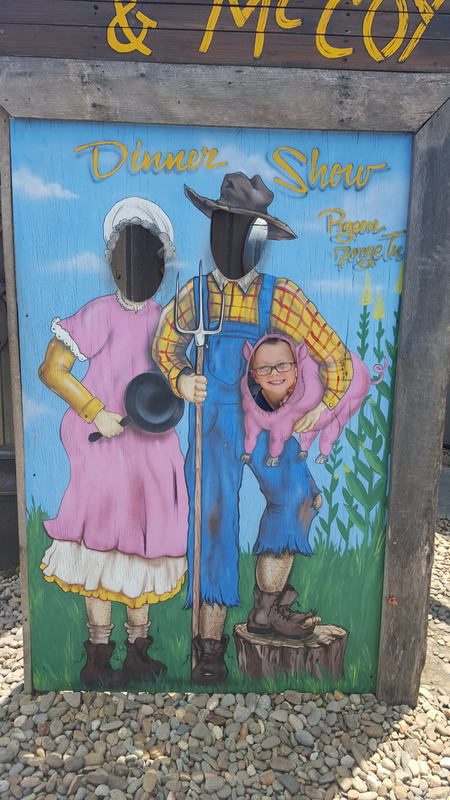 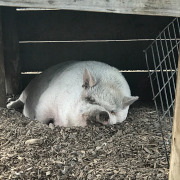 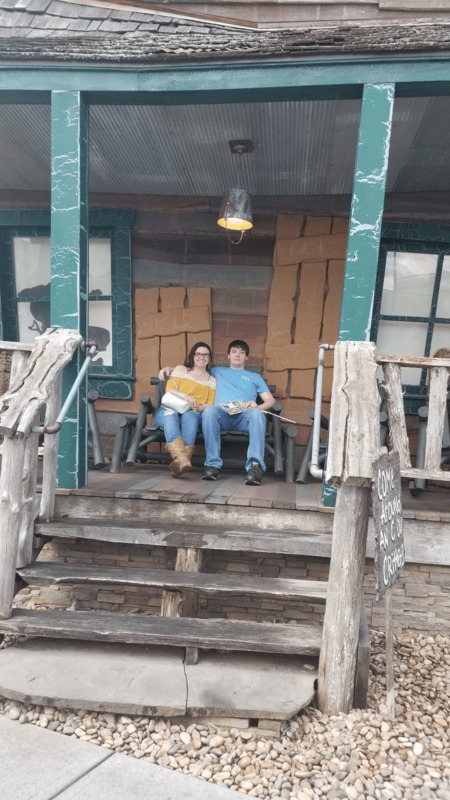 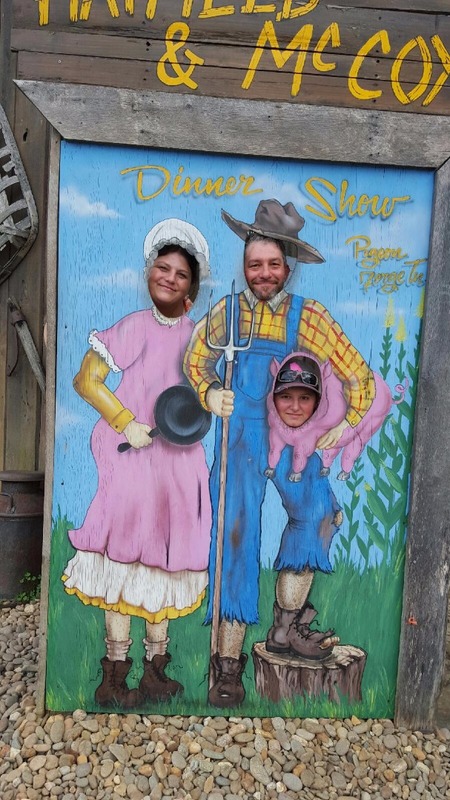 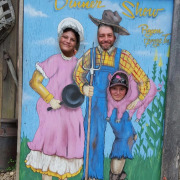 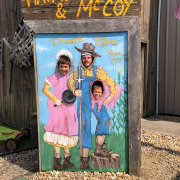 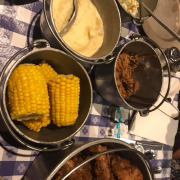 And the country cookin’ — whooee it’s good! 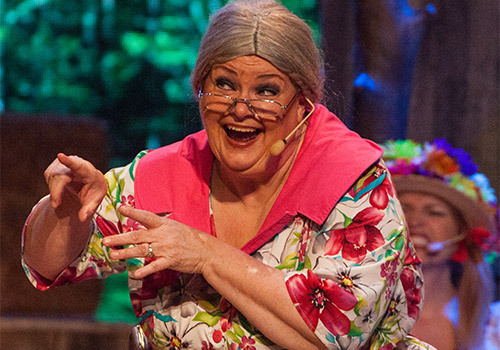 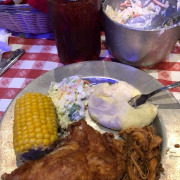 Granny’s cookin’ up a heap of fried chicken and country pulled pork barbecue! 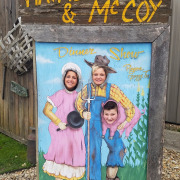 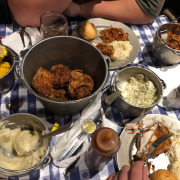 Add smashed taters, creamy cole slaw, buttery corn on the cob, homemade rolls, creamy vegetable soup and Granny’s special dessert and you’ll need to loosen up your belt! 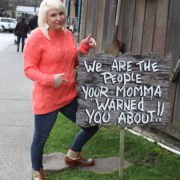 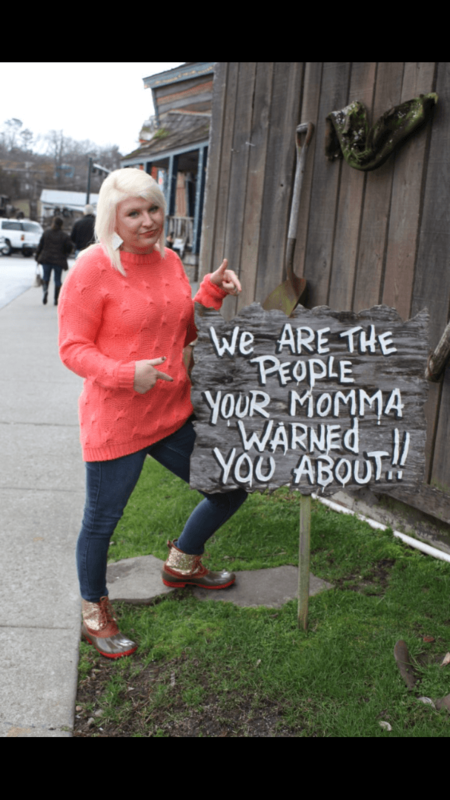 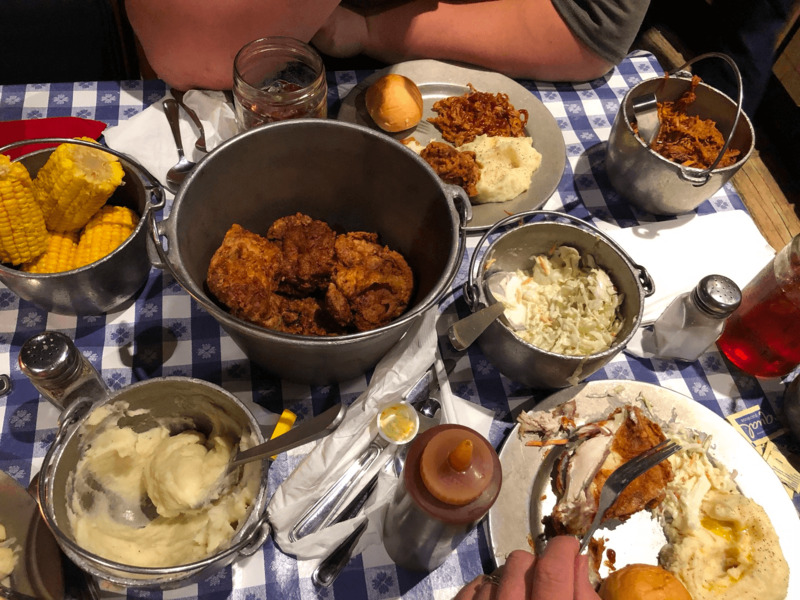 Best dinner in town – Granny guarantees it! 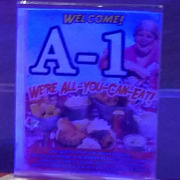 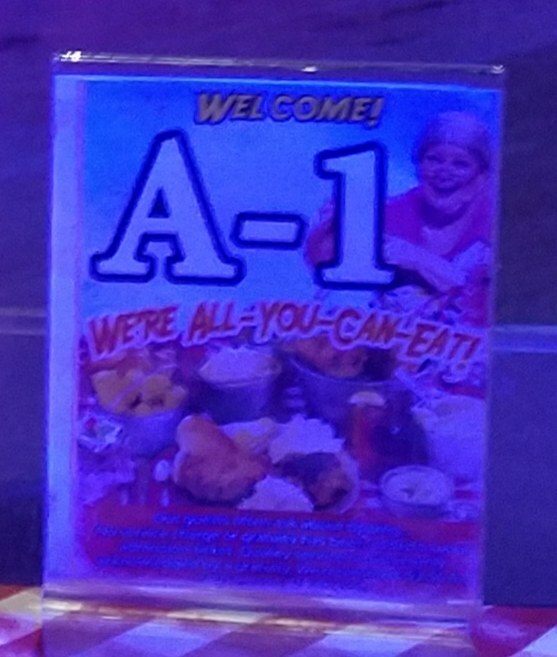 Come hungry 'cause it’s all you can eat! 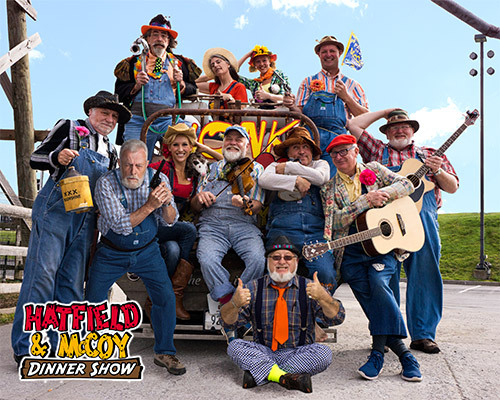 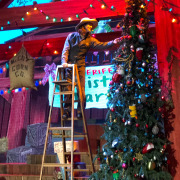 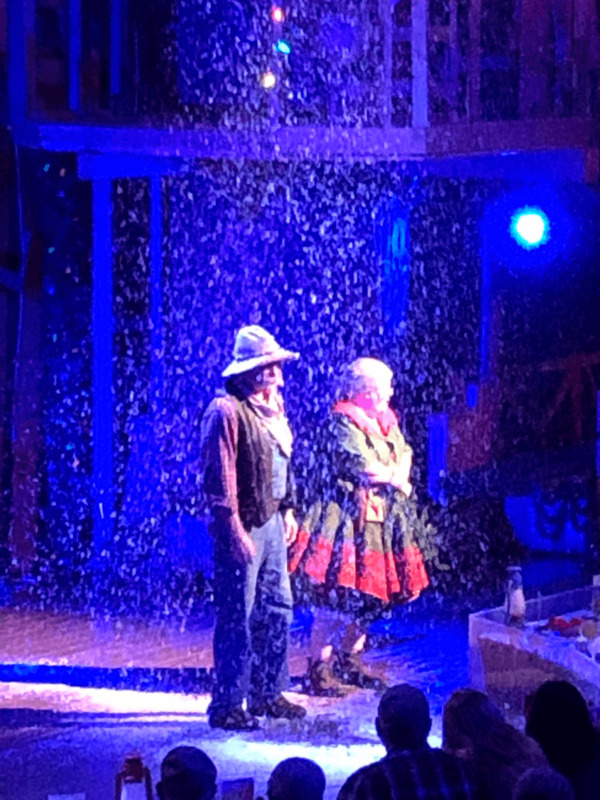 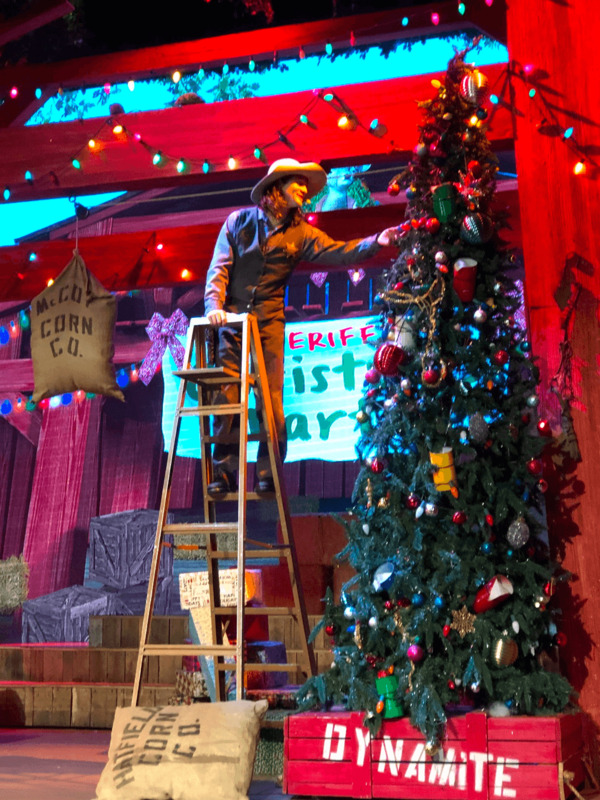 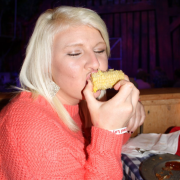 In November and December, the show transforms into the Christmas-themed Hatfield & McCoy Christmas Dinner Disaster! 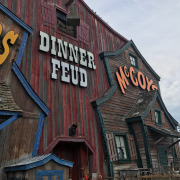 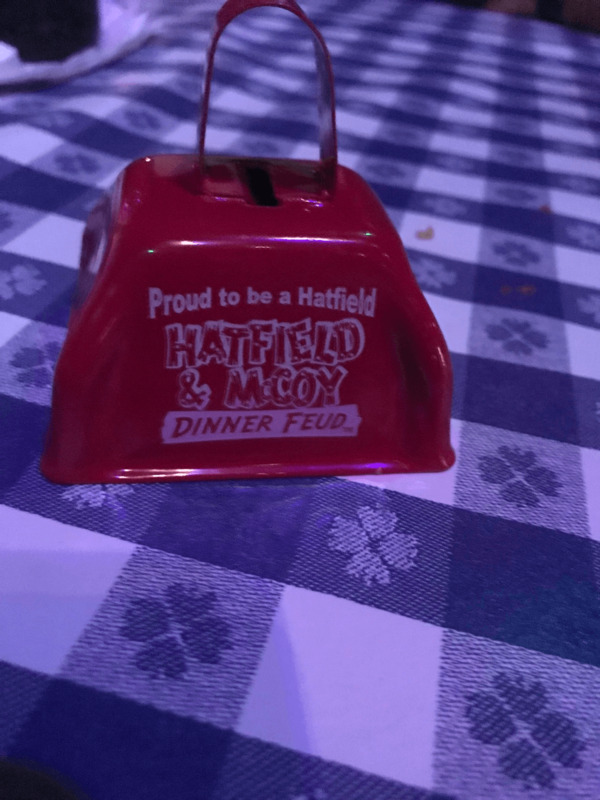 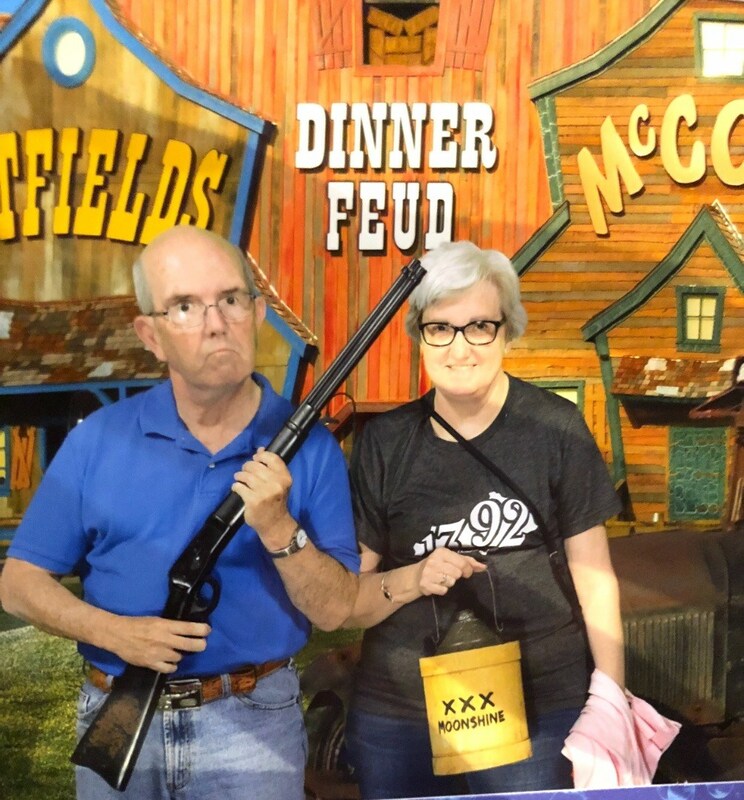 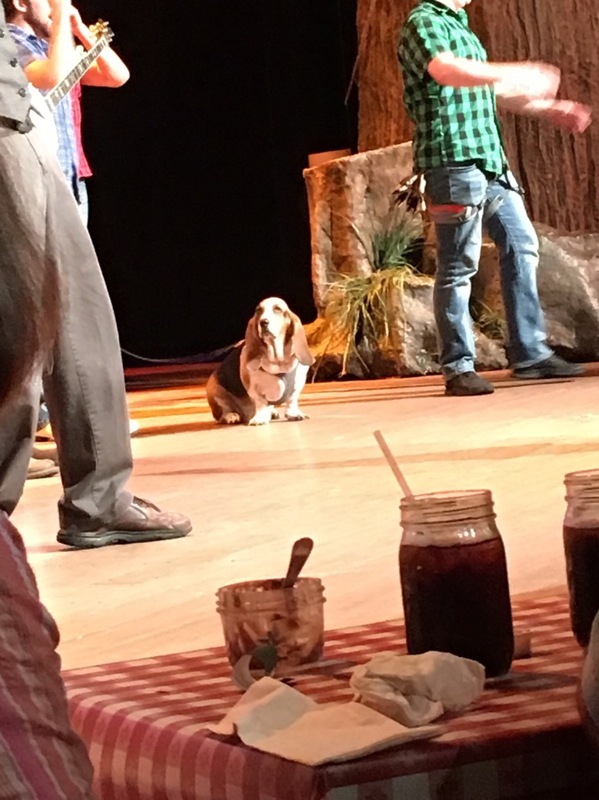 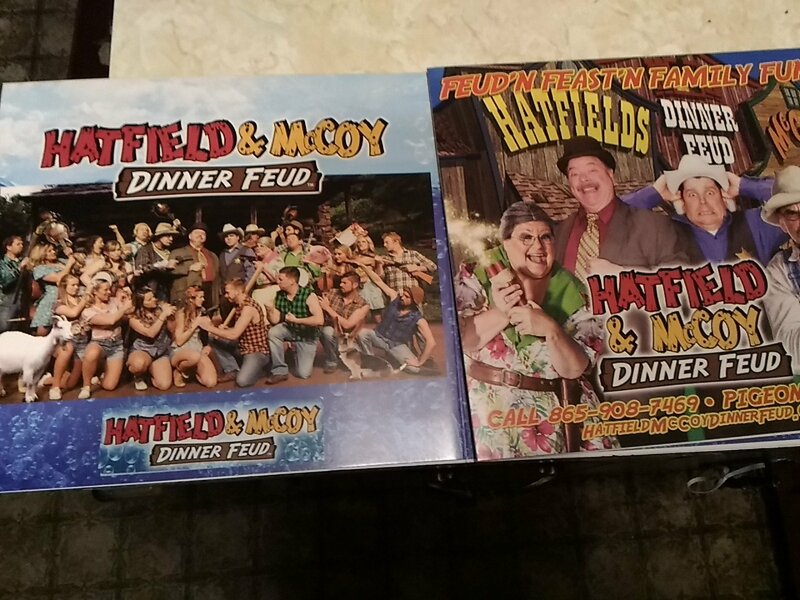 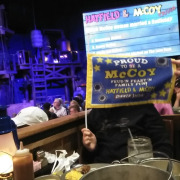 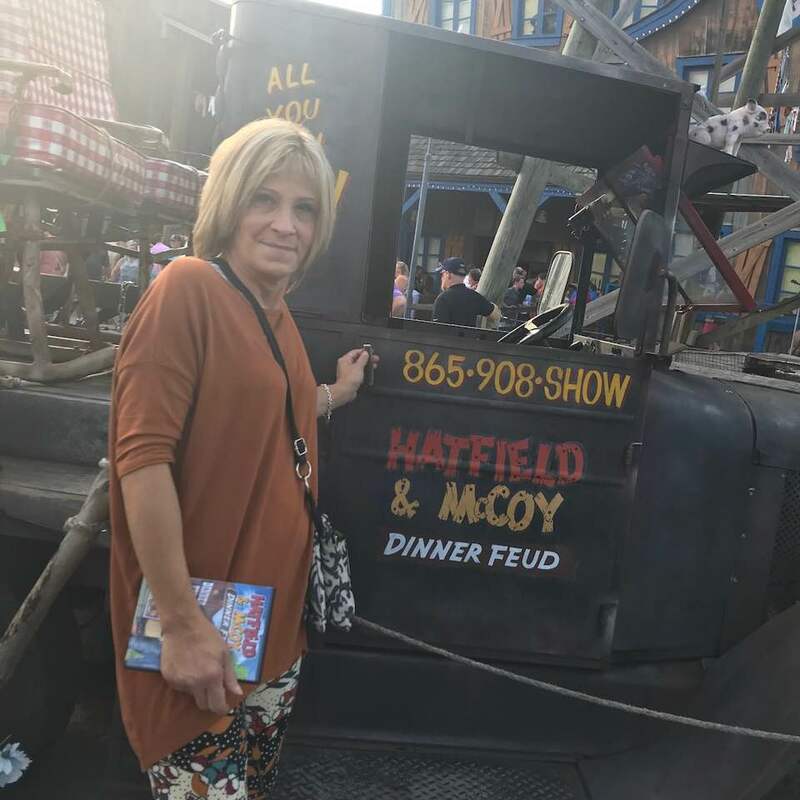 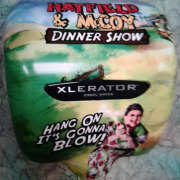 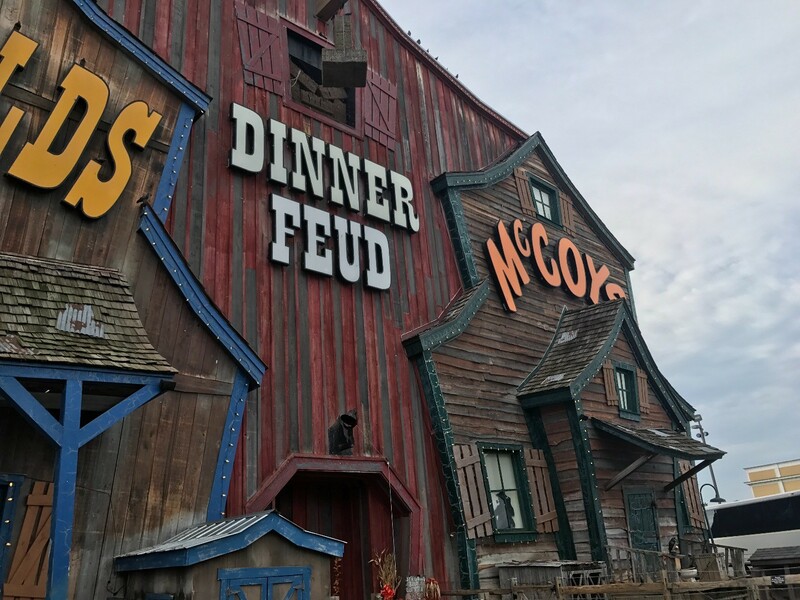 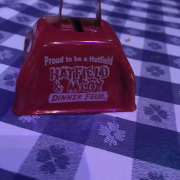 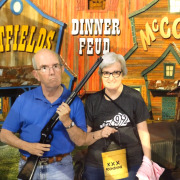 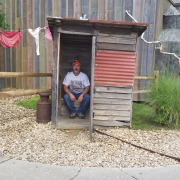 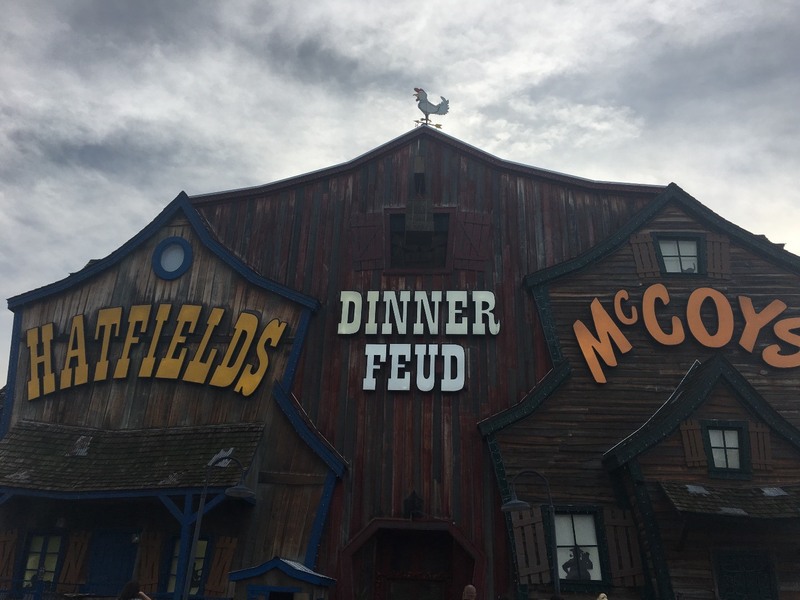 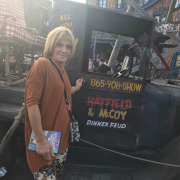 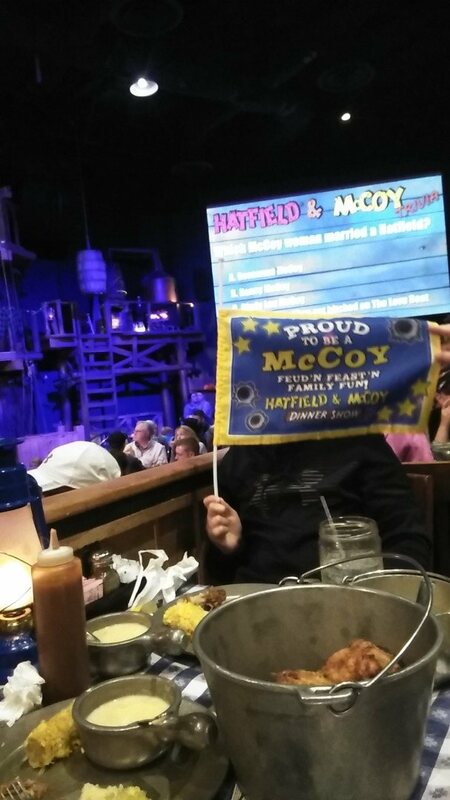 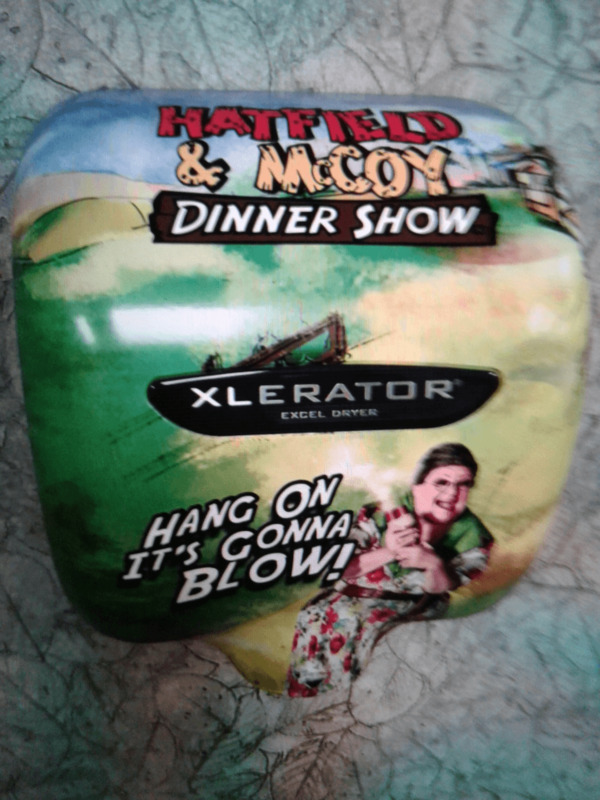 Is there a pre-show at Hatfield & McCoy Dinner Feud? 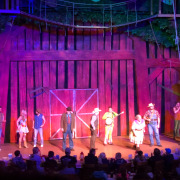 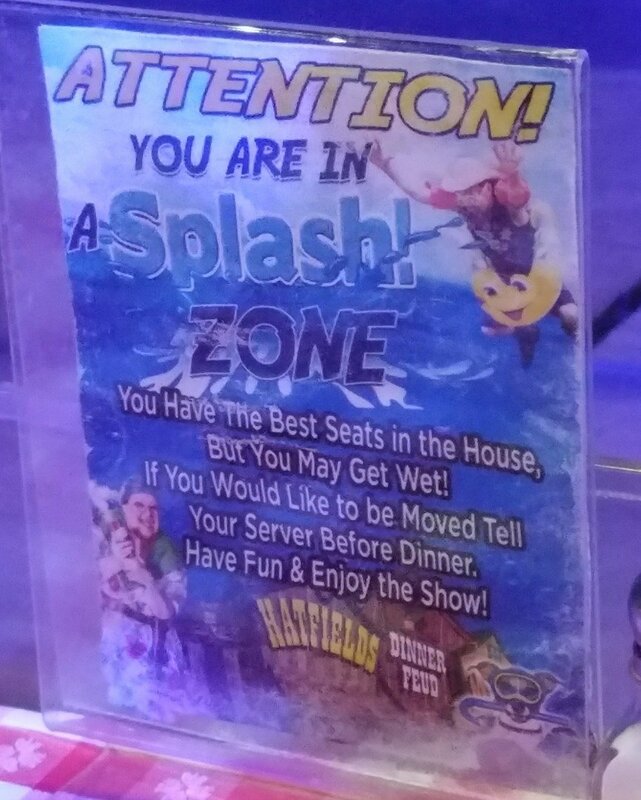 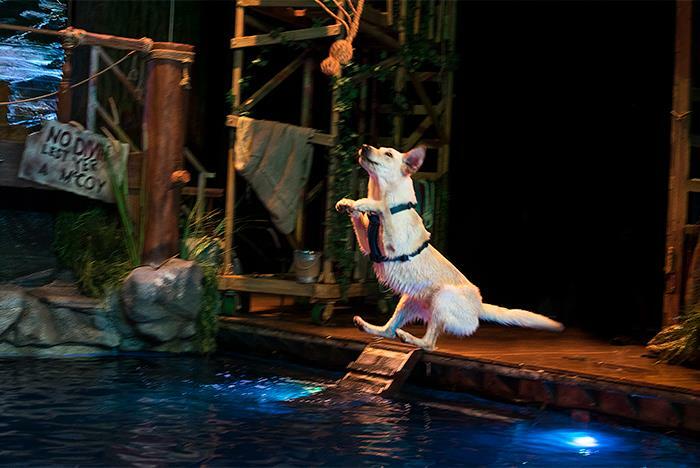 Guests should arrive 30 to 45 minutes prior to show time. 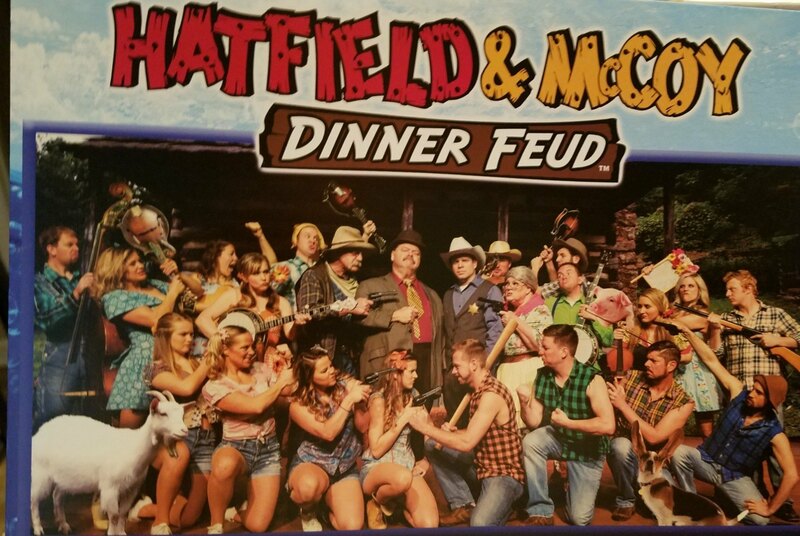 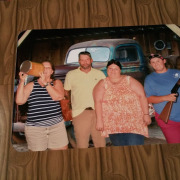 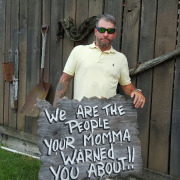 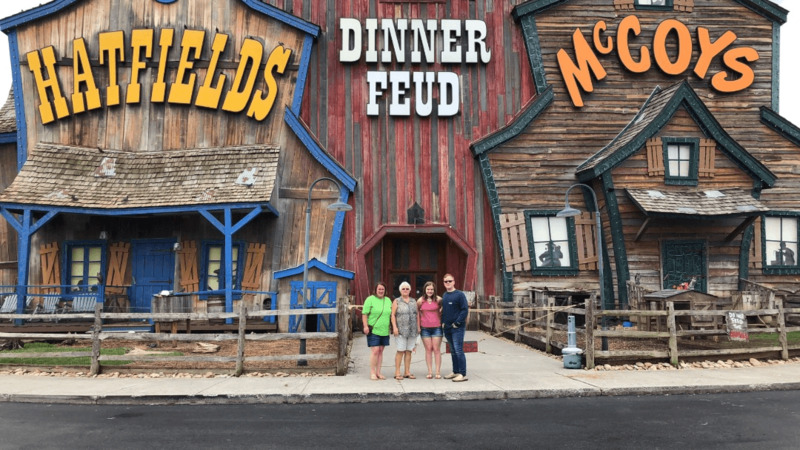 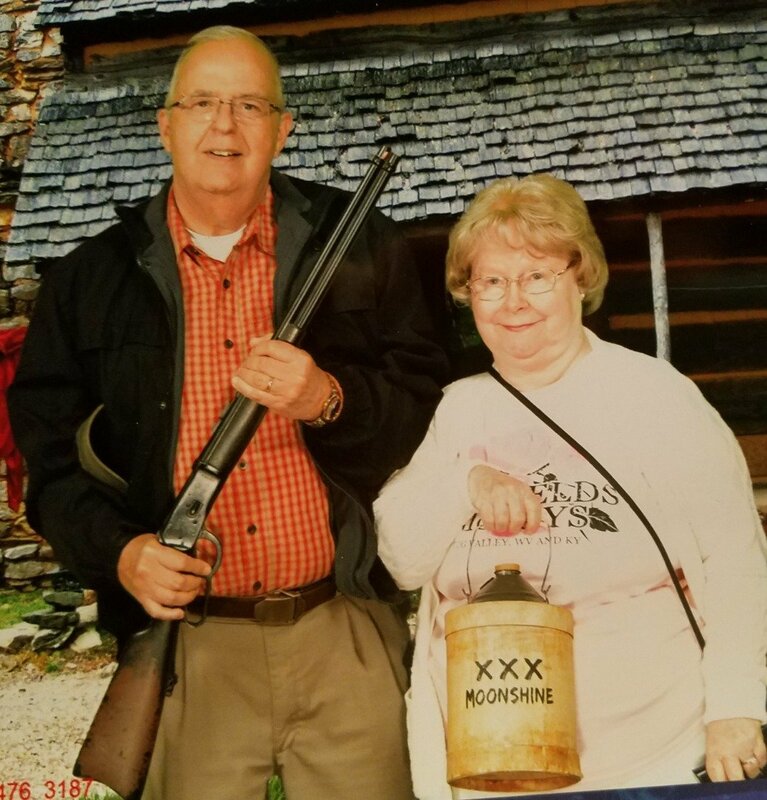 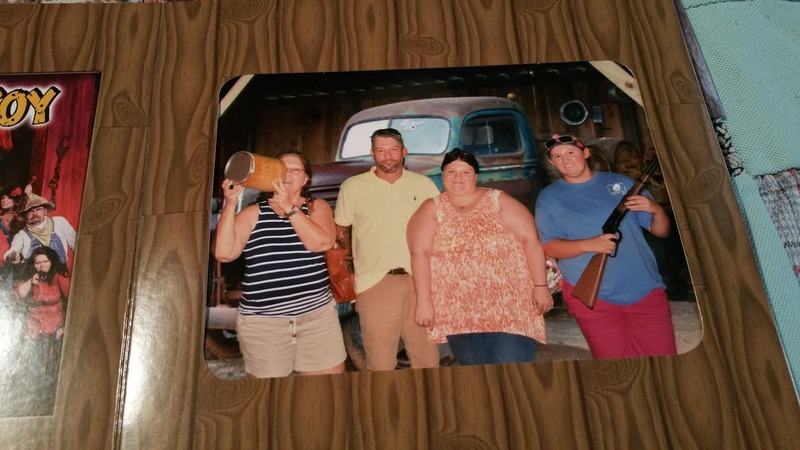 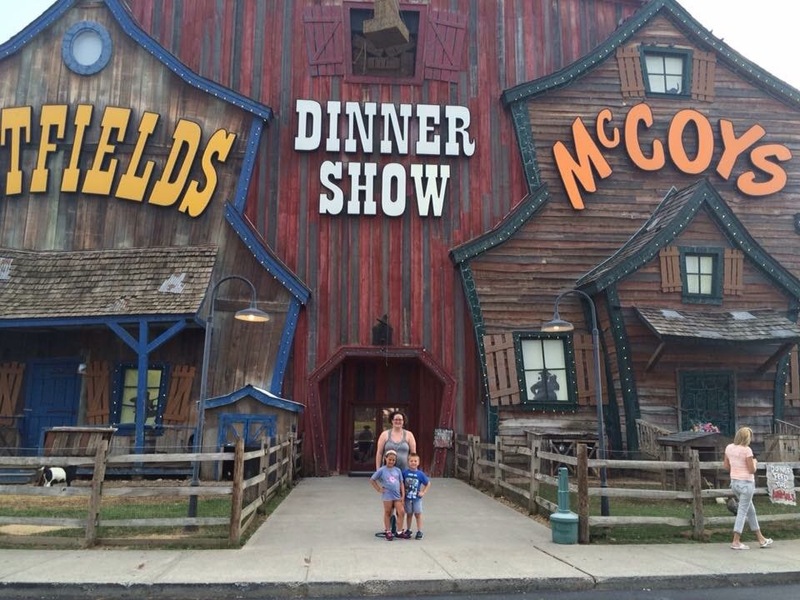 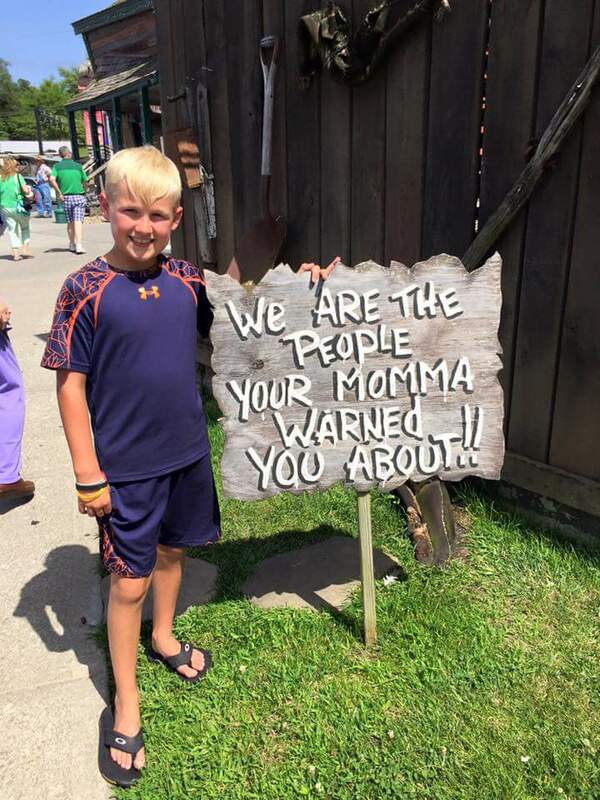 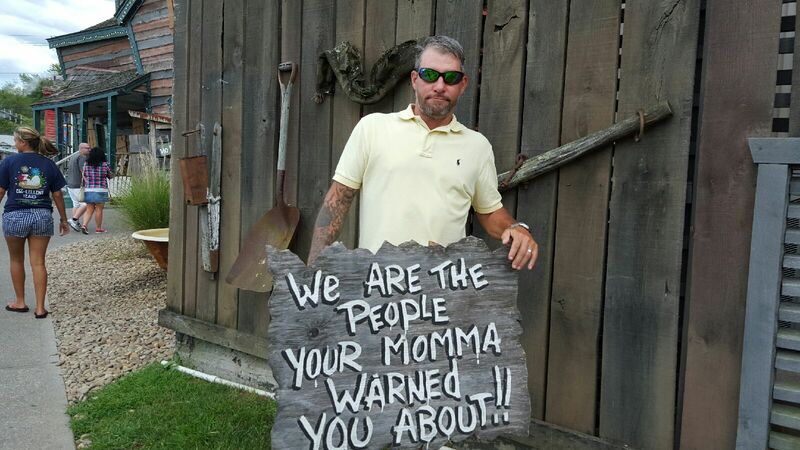 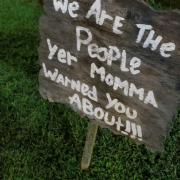 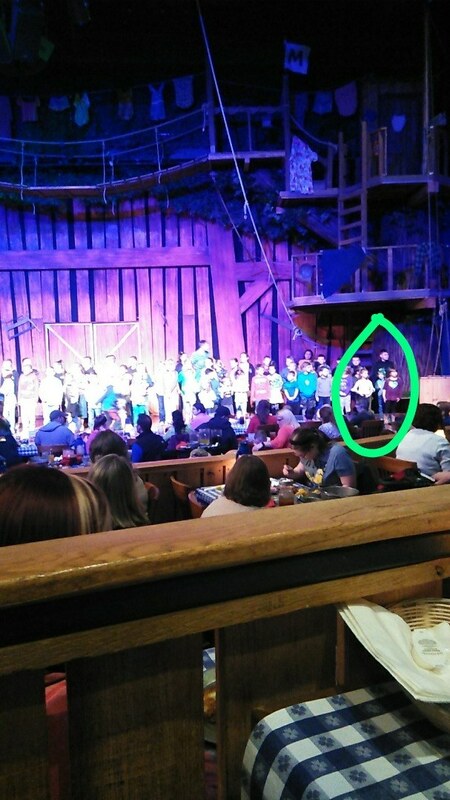 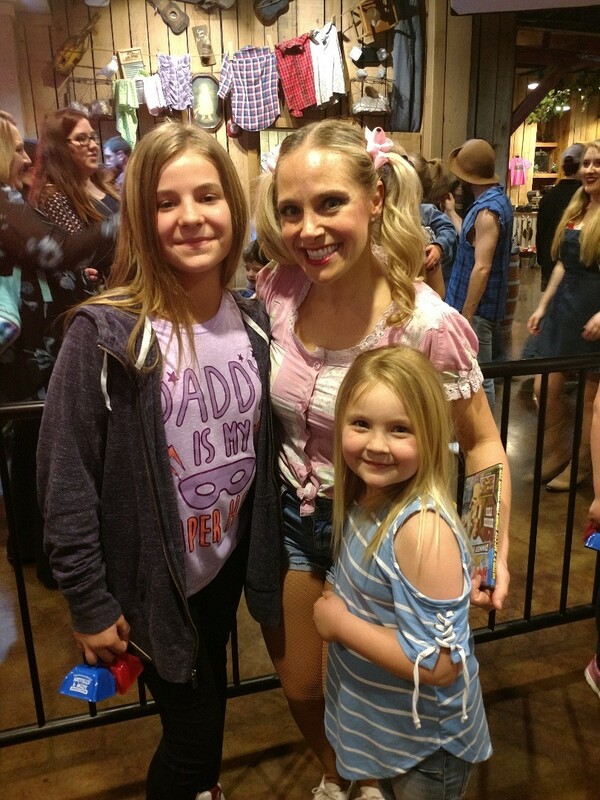 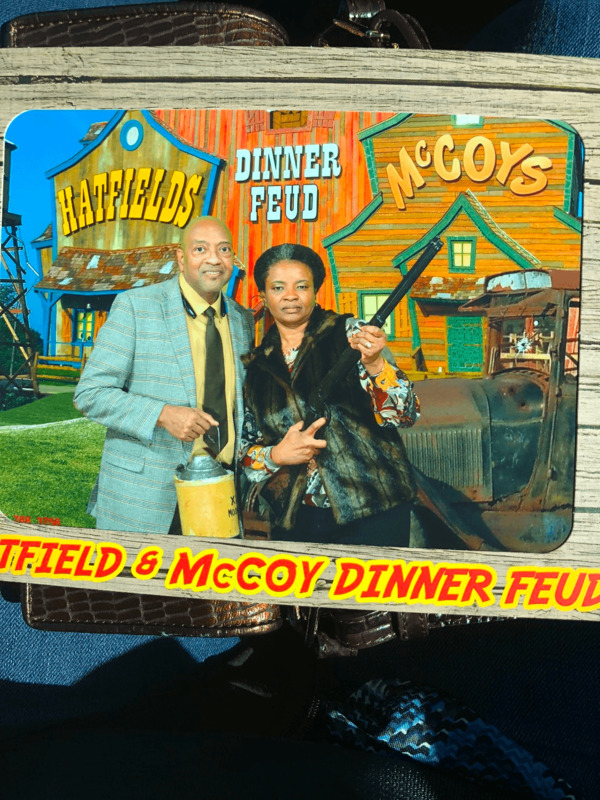 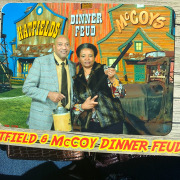 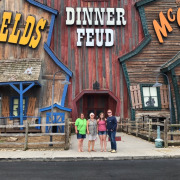 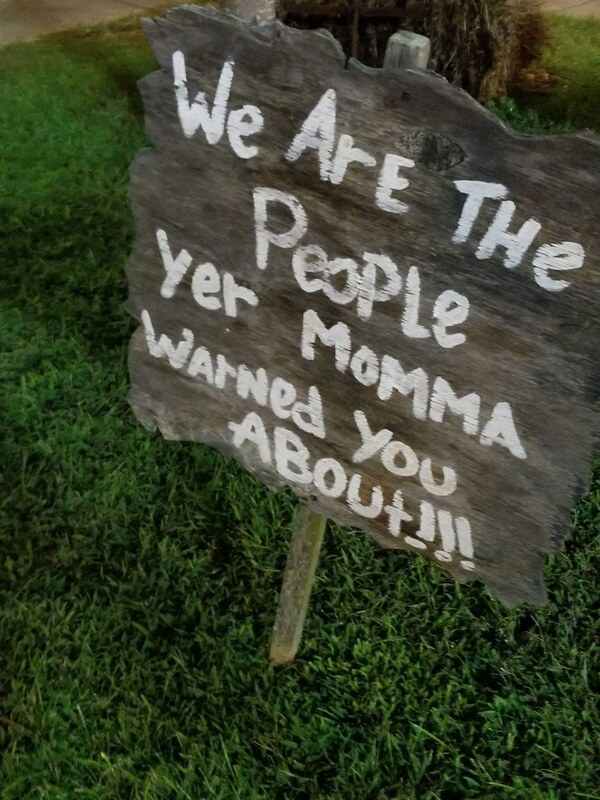 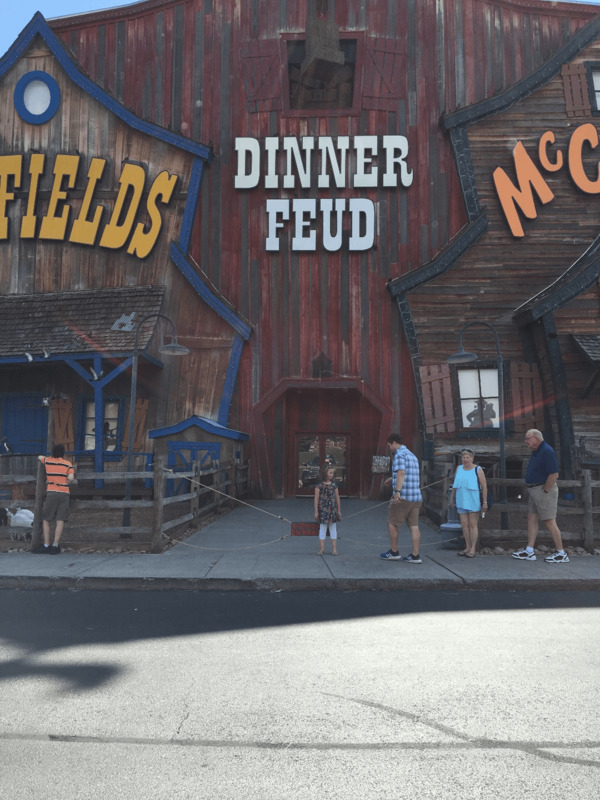 Are visitors allowed to meet and greet the performers of Hatfield & McCoy Dinner Feud? 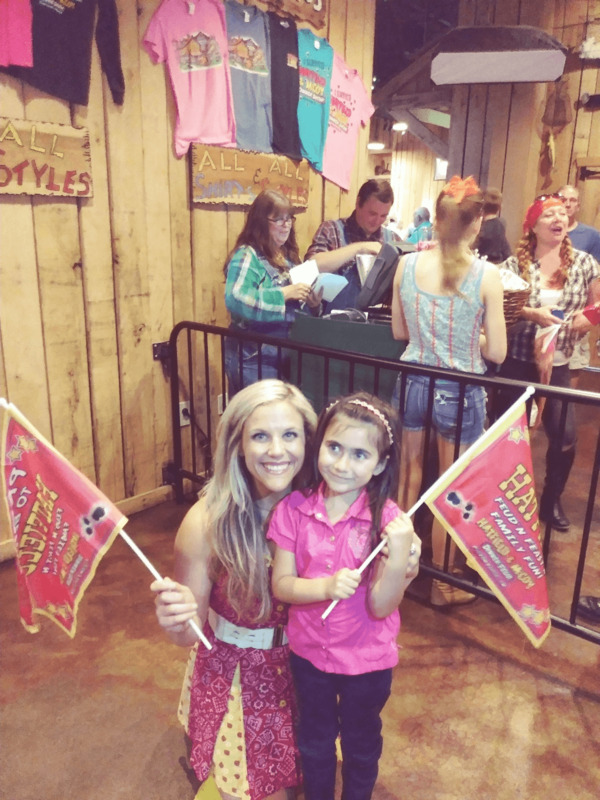 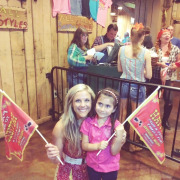 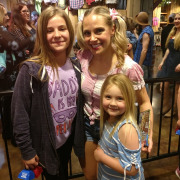 Yes, meet and greets take place after the show. 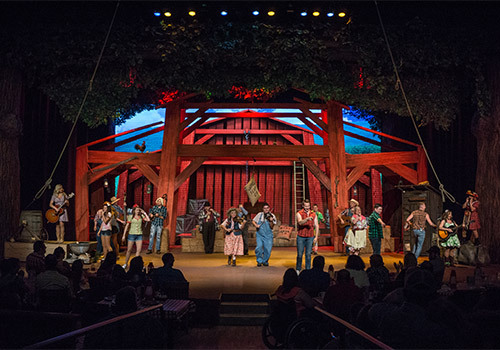 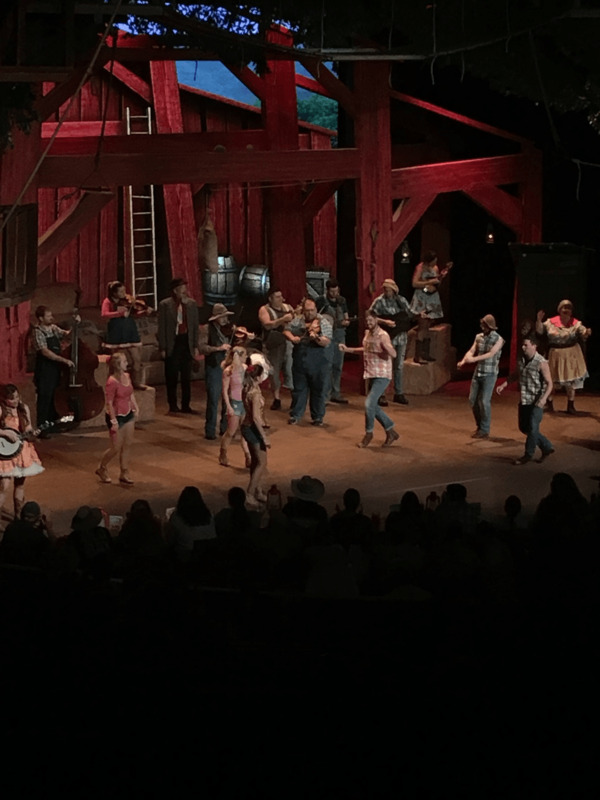 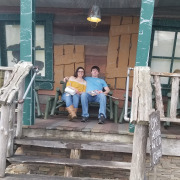 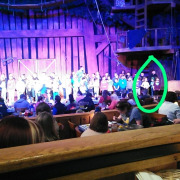 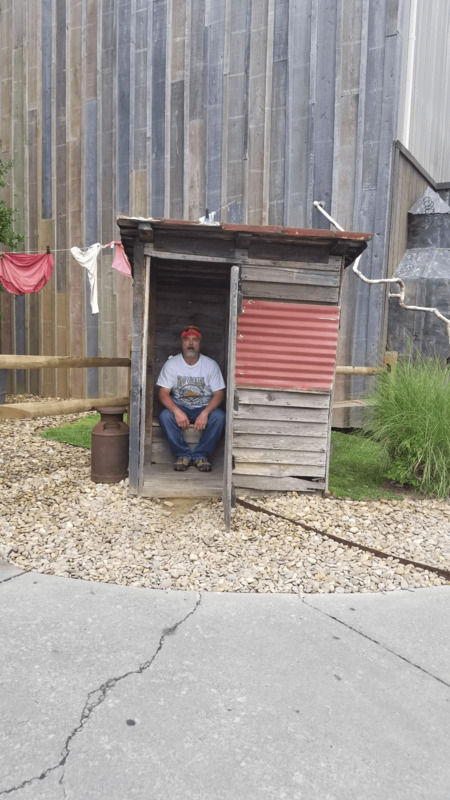 How is seating arranged at the Hatfield & McCoy Theater? 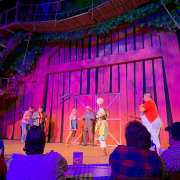 The theater features restaurant-style seating with a capacity for 698 people. 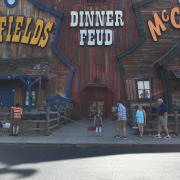 What type of menu is served? 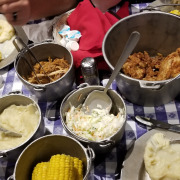 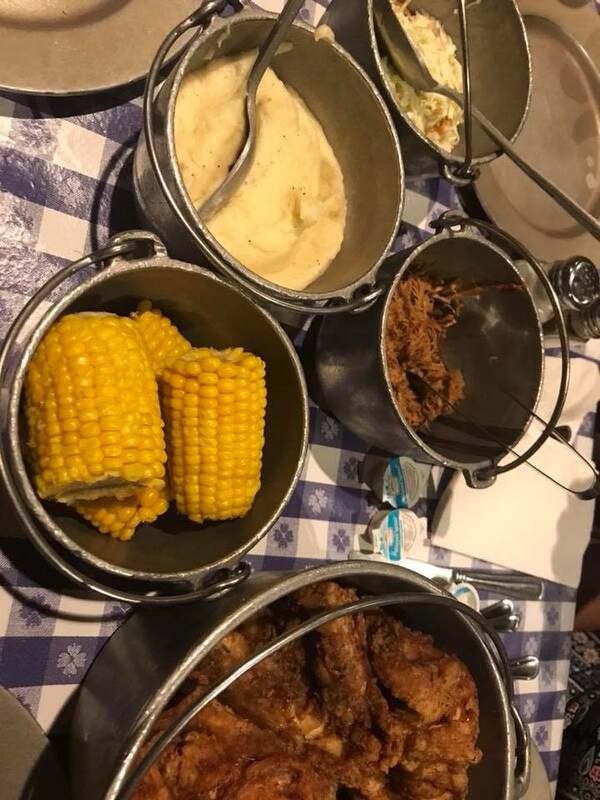 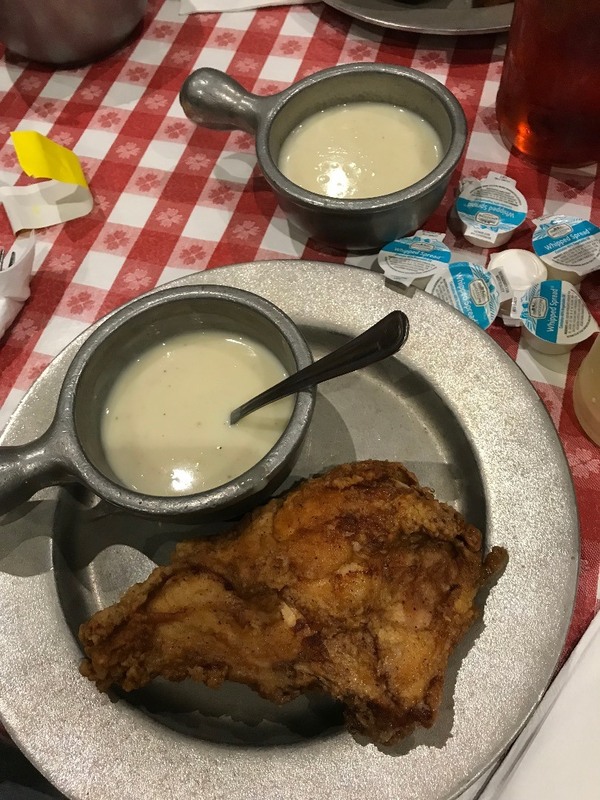 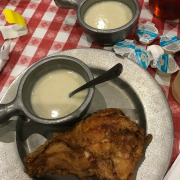 The meal includes Fried Chicken, Pulled Pork Barbeque, Southern Style Creamy Soup, Mashed Potatoes, Corn on the Cob, Homemade Bread, Coleslaw, and dessert. 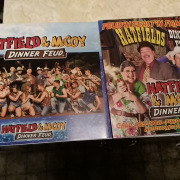 Is there an intermission at the Hatfield & McCoy Dinner Feud? 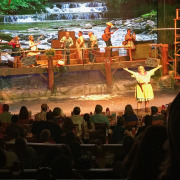 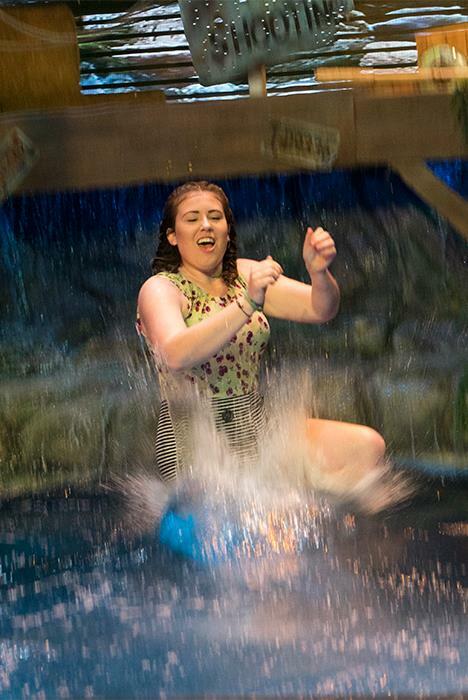 The show lasts about 1 hour and 45 minutes to 2 hours.